Definition at line 244 of file llvoavatar.h. Definition at line 724 of file llvoavatar.h. Definition at line 719 of file llvoavatar.h. Definition at line 725 of file llvoavatar.h. Definition at line 679 of file llvoavatar.h. Definition at line 261 of file llvoavatar.h. Definition at line 503 of file llvoavatar.h. Definition at line 332 of file llvoavatar.h. Definition at line 938 of file llvoavatar.cpp. References cullAvatarsByPixelArea(), gAgent, lldebugs, llendl, mAnimationSources, mAttachmentPoints, mCollisionVolumes, LLViewerObject::mDead, mEyesLayerSet, mHeadLayerSet, LLViewerObject::mID, mIsSelf, mLowerBodyLayerSet, mMeshes, mNumJoints, mRoot, mScreenp, mSkeleton, mSkirtLayerSet, mTexEyeColor, mTexHairColor, mTexSkinColor, mUpperBodyLayerSet, NULL, LLJoint::removeAllChildren(), LLAgent::setAvatarObject(), and TRUE. Definition at line 609 of file llvoavatar.cpp. References LLCharacter::addMotion(), ANIM_AGENT_BODY_NOISE, ANIM_AGENT_BREATHE_ROT, ANIM_AGENT_BUSY, ANIM_AGENT_CROUCH, ANIM_AGENT_CROUCHWALK, ANIM_AGENT_CUSTOMIZE, ANIM_AGENT_CUSTOMIZE_DONE, ANIM_AGENT_EDITING, ANIM_AGENT_EXPRESS_AFRAID, ANIM_AGENT_EXPRESS_ANGER, ANIM_AGENT_EXPRESS_BORED, ANIM_AGENT_EXPRESS_CRY, ANIM_AGENT_EXPRESS_DISDAIN, ANIM_AGENT_EXPRESS_EMBARRASSED, ANIM_AGENT_EXPRESS_FROWN, ANIM_AGENT_EXPRESS_KISS, ANIM_AGENT_EXPRESS_LAUGH, ANIM_AGENT_EXPRESS_OPEN_MOUTH, ANIM_AGENT_EXPRESS_REPULSED, ANIM_AGENT_EXPRESS_SAD, ANIM_AGENT_EXPRESS_SHRUG, ANIM_AGENT_EXPRESS_SMILE, ANIM_AGENT_EXPRESS_SURPRISE, ANIM_AGENT_EXPRESS_TONGUE_OUT, ANIM_AGENT_EXPRESS_TOOTHSMILE, ANIM_AGENT_EXPRESS_WINK, ANIM_AGENT_EXPRESS_WORRY, ANIM_AGENT_EYE, ANIM_AGENT_FEMALE_WALK, ANIM_AGENT_FLY_ADJUST, ANIM_AGENT_HAND_MOTION, ANIM_AGENT_HEAD_ROT, ANIM_AGENT_PELVIS_FIX, ANIM_AGENT_RUN, ANIM_AGENT_SIT_FEMALE, ANIM_AGENT_STAND, ANIM_AGENT_STAND_1, ANIM_AGENT_STAND_2, ANIM_AGENT_STAND_3, ANIM_AGENT_STAND_4, ANIM_AGENT_STANDUP, ANIM_AGENT_TARGET, ANIM_AGENT_TURNLEFT, ANIM_AGENT_TURNRIGHT, ANIM_AGENT_WALK, ANIM_AGENT_WALK_ADJUST, AVATAR_DEFAULT_CHAR, buildCharacter(), LLWalkAdjustMotion::create(), LLTargetingMotion::create(), LLKeyframeMotion::create(), LLPelvisFixMotion::create(), LLHeadRotMotion::create(), LLHandMotion::create(), LLFlyAdjustMotion::create(), LLEyeMotion::create(), LLEditingMotion::create(), LLBreatheMotionRot::create(), LLBodyNoiseMotion::create(), LLKeyframeFallMotion::create(), LLEmote::create(), LLKeyframeWalkMotion::create(), LLKeyframeStandMotion::create(), LLNullMotion::create(), LLCharacter::createMotion(), LLHUDManager::createViewerEffect(), f, FALSE, gAgent, gAgentID, LLViewerImageList::getImage(), LLControlGroup::getString(), LLVoiceClient::getVoiceEnabled(), gHUDManager, gImageList, gNoRender, gStaticVFS, gViewerArt, gVoiceClient, i, LLHUDObject::LL_HUD_EFFECT_VOICE_VISUALIZER, lldebugs, llendl, LOCTEX_NUM_ENTRIES, mAvatarDefinition, MAX_DISCARD_LEVEL, LLViewerObject::mbCanSelect, mCollisionVolumes, mCurrentGesticulationLevel, mDirtyMesh, MESH_ID_HAIR, MESH_ID_HEAD, MESH_ID_LOWER_BODY, MESH_ID_SKIRT, MESH_ID_UPPER_BODY, mEyeBallLeftLOD, mEyeBallLeftMesh0, mEyeBallLeftMesh1, mEyeBallRightLOD, mEyeBallRightMesh0, mEyeBallRightMesh1, mEyeLashLOD, mEyeLashMesh0, mHairLOD, mHairMesh0, mHairMesh1, mHairMesh2, mHairMesh3, mHairMesh4, mHairMesh5, mHeadLOD, mHeadMesh0, mHeadMesh1, mHeadMesh2, mHeadMesh3, mHeadMesh4, mHeadp, LLViewerObject::mID, mInAir, mIsBuilt, mIsSelf, mLocalTextureBaked, mLocalTextureDiscard, mLowerBodyLOD, mLowerBodyMesh0, mLowerBodyMesh1, mLowerBodyMesh2, mLowerBodyMesh3, mLowerBodyMesh4, mNumCollisionVolumes, mNumJoints, mPelvisp, mPlayingAnimations, mRippleTimeLast, mRoot, mScreenp, mShadow0Facep, mShadow1Facep, mShadowImageID, mShadowImagep, mSignaledAnimations, mSkeleton, mSkirtLOD, mSkirtMesh0, mSkirtMesh1, mSkirtMesh2, mSkirtMesh3, mSkirtMesh4, mSpeed, mSpeedAccum, mStepMaterial, mStepOnLand, mTimeLast, LLMemType::MTYPE_AVATAR, mUpperBodyLOD, mUpperBodyMesh0, mUpperBodyMesh1, mUpperBodyMesh2, mUpperBodyMesh3, mUpperBodyMesh4, mVoiceVisualizer, mWasOnGroundLeft, mWasOnGroundRight, NULL, LLViewerJoint::PN_0, LLViewerJoint::PN_1, LLViewerJoint::PN_2, LLViewerJoint::PN_3, LLViewerJoint::PN_4, LLViewerJoint::PN_5, S32, LLCharacter::setAnimationData(), LLAgent::setAvatarObject(), LLViewerJointMesh::setIsTransparent(), LLViewerJointMesh::setMeshID(), LLJoint::setName(), LLViewerObject::setNumTEs(), LLViewerJoint::setPickName(), LLViewerJointMesh::setSpecular(), LLKeyframeMotion::setVFS(), LLVoiceVisualizer::setVoiceEnabled(), LLCharacter::sInstances, size, TEX_NUM_ENTRIES, and TRUE. Definition at line 4242 of file llvoavatar.cpp. References LLViewerImage::addTextureStats(), llmax(), llmin(), mMaxPixelArea, mMinPixelArea, and LLViewerImage::setBoostLevel(). Definition at line 7156 of file llvoavatar.cpp. References MAX_BUBBLE_CHAT_LENGTH, MAX_BUBBLE_CHAT_UTTERANCES, mChats, mChatTimer, LLFrameTimer::reset(), and S32. Definition at line 5789 of file llvoavatar.cpp. Definition at line 4620 of file llvoavatar.cpp. Definition at line 4219 of file llvoavatar.cpp. 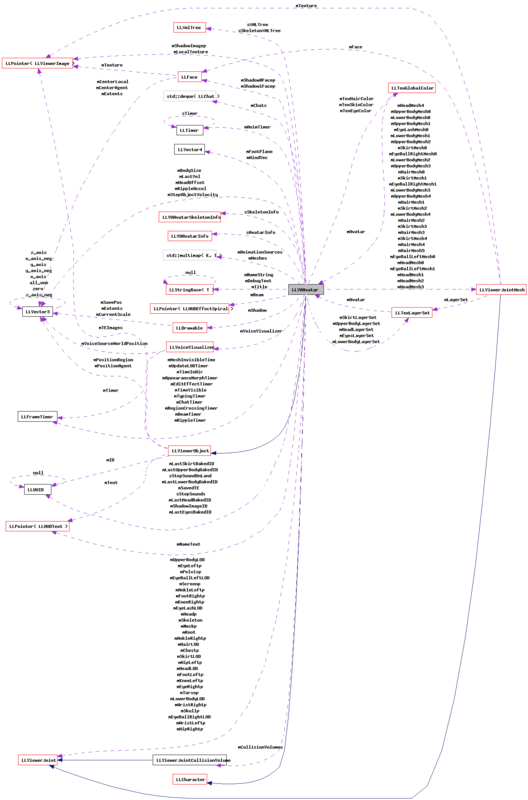 References LLViewerImage::addTextureStats(), LLViewerImage::BOOST_AVATAR, LLViewerImage::BOOST_AVATAR_SELF, getID(), IMG_DEFAULT_AVATAR, llmin(), LOCTEX_IMAGE_AREA_OTHER, LOCTEX_IMAGE_AREA_SELF, mIsSelf, mLocalTexture, LLViewerObject::mPixelArea, and LLViewerImage::setBoostLevel(). Definition at line 4776 of file llvoavatar.cpp. References FALSE, mNumJoints, mSkeleton, NULL, S32, and TRUE. Definition at line 4801 of file llvoavatar.cpp. References FALSE, mCollisionVolumes, mNumCollisionVolumes, NULL, and TRUE. Definition at line 1044 of file llvoavatar.cpp. References FALSE, MIN_PIXEL_AREA_FOR_COMPOSITE, LLCharacter::sInstances, and TRUE. Definition at line 5818 of file llvoavatar.cpp. References LLInventoryModel::addChangedMask(), LLViewerJointAttachment::addObject(), FALSE, gAgent, LLAgent::getCameraMode(), LLViewerJointAttachment::getItemID(), getTargetAttachmentPoint(), gInventory, gSelectMgr, LLViewerObject::isSelected(), LLInventoryObserver::LABEL, mIsSelf, LLInventoryModel::notifyObservers(), TRUE, updateAttachmentVisibility(), LLSelectMgr::updatePointAt(), and LLSelectMgr::updateSelectionCenter(). Definition at line 6468 of file llvoavatar.cpp. References LLImageGL::bindExternalTexture(), FALSE, getScratchTexName(), LLImageGL::sLastFrameTime, sScratchTexLastBindTime, stop_glerror, TRUE, and LLImageGL::updateBoundTexMem(). Definition at line 1627 of file llvoavatar.cpp. References LLObservable::addListener(), ANIM_AGENT_BODY_NOISE, ANIM_AGENT_BREATHE_ROT, ANIM_AGENT_EYE, ANIM_AGENT_HAND_MOTION, ANIM_AGENT_HEAD_ROT, ANIM_AGENT_PELVIS_FIX, LLMenuGL::append(), LLPieMenu::append(), LLPieMenu::appendMenu(), LLMenuGL::appendSeparator(), LLPieMenu::appendSeparator(), attach_label(), detach_label(), f, FALSE, LLJoint::findJoint(), LLCharacter::flushAllMotions(), gAttachBodyPartPieMenus, gAttachPieMenu, gAttachScreenPieMenu, gAttachSubMenu, gDetachBodyPartPieMenus, gDetachPieMenu, gDetachScreenPieMenu, gDetachSubMenu, LLTimer::getElapsedTimeF32(), LLView::getListenerByName(), LLJoint::getName(), gMenuHolder, gNoRender, handle_detach_from_avatar(), i, lldebugs, llendl, llerrs, llwarns, loadAvatar(), mAnkleLeftp, mAnkleRightp, mAttachmentPoints, mChestp, mEyeBallLeftMesh0, mEyeBallLeftMesh1, mEyeBallRightMesh0, mEyeBallRightMesh1, mEyeLashMesh0, mEyeLeftp, mEyeRightp, mFootLeftp, mFootRightp, mHairMesh0, mHairMesh1, mHairMesh2, mHairMesh3, mHairMesh4, mHairMesh5, mHeadMesh0, mHeadMesh1, mHeadMesh2, mHeadMesh3, mHeadMesh4, mHeadp, mHipLeftp, mHipRightp, mIsBuilt, mIsSelf, mKneeLeftp, mKneeRightp, mLowerBodyMesh0, mLowerBodyMesh1, mLowerBodyMesh2, mLowerBodyMesh3, mLowerBodyMesh4, mMeshValid, mNeckp, mPelvisp, mRoot, mSkirtMesh0, mSkirtMesh1, mSkirtMesh2, mSkirtMesh3, mSkirtMesh4, mSkullp, mTorsop, LLMemType::MTYPE_AVATAR, mUpperBodyMesh0, mUpperBodyMesh1, mUpperBodyMesh2, mUpperBodyMesh3, mUpperBodyMesh4, mWristLeftp, mWristRightp, NULL, object_attached(), object_selected_and_point_valid(), processAnimationStateChanges(), LLJoint::removeAllChildren(), S32, LLViewerJointMesh::setMesh(), LLJoint::setPosition(), startMotion(), stop_glerror, TRUE, and updateHeadOffset(). Definition at line 1568 of file llvoavatar.cpp. References allocateCharacterJoints(), allocateCollisionVolumes(), f, FALSE, gCamera, LLCamera::getAspect(), llendl, llerrs, LLVOAvatarSkeletonInfo::mBoneInfoList, mIsSelf, LLVOAvatarSkeletonInfo::mNumBones, LLVOAvatarSkeletonInfo::mNumCollisionVolumes, mScreenp, LLMemType::MTYPE_AVATAR, NULL, sCurJoint, sCurVolume, LLJoint::setScale(), setupBone(), LLJoint::setWorldPosition(), TRUE, and LLVector3::zero. Definition at line 8514 of file llvoavatar.cpp. References LLPermissions::allowOperationBy(), LLInventoryModel::collectDescendentsIf(), LLDynamicArray< Type, BlockSize >::count(), end, FALSE, gAgent, LLAgent::getGroupID(), LLAgent::getID(), LLViewerImage::getID(), getID(), LLViewerObject::getTEImage(), gInventory, i, IMG_DEFAULT_AVATAR, LLInventoryModel::INCLUDE_TRASH, lldebugs, llendl, LLUUID::null, PERM_COPY, PERM_MODIFY, PERM_TRANSFER, S32, TEX_EYES_BAKED, TEX_EYES_IRIS, TEX_HEAD_BAKED, TEX_HEAD_BODYPAINT, TEX_LOWER_BAKED, TEX_LOWER_BODYPAINT, TEX_LOWER_JACKET, TEX_LOWER_PANTS, TEX_LOWER_SHOES, TEX_LOWER_SOCKS, TEX_LOWER_UNDERPANTS, TEX_SKIRT, TEX_SKIRT_BAKED, TEX_UPPER_BAKED, TEX_UPPER_BODYPAINT, TEX_UPPER_GLOVES, TEX_UPPER_JACKET, TEX_UPPER_SHIRT, TEX_UPPER_UNDERSHIRT, textures, and TRUE. Referenced by enable_grab_texture(), and grabLocalTexture(). Definition at line 7824 of file llvoavatar.cpp. Referenced by LLManipTranslate::handleHover(), LLViewerObject::processUpdateMessage(), LLViewerObject::setPositionAbsoluteGlobal(), and LLViewerObject::setPositionGlobal(). Definition at line 1432 of file llvoavatar.cpp. References LLXmlTree::cleanup(), NULL, sAvatarInfo, sSkeletonInfo, sSkeletonXMLTree, and sXMLTree. Definition at line 1259 of file llvoavatar.cpp. Definition at line 7180 of file llvoavatar.cpp. Definition at line 2105 of file llvoavatar.cpp. References DEFAULT_AGENT_DEPTH, DEFAULT_AGENT_WIDTH, F_SQRT2, LLJoint::getPosition(), LLJoint::getScale(), mAnkleLeftp, mBodySize, mChestp, mFootLeftp, mHeadp, mHipLeftp, mKneeLeftp, mNeckp, mPelvisp, mPelvisToFoot, mSkullp, mTorsop, LLVector3::mV, VX, VY, and VZ. Definition at line 5531 of file llvoavatar.cpp. References LLDrawable::ACTIVE, LLPipeline::allocDrawable(), dirtyMesh(), FALSE, LLPipeline::getPool(), gPipeline, LLViewerObject::mDrawable, mShadow0Facep, mShadow1Facep, mShadowImagep, NULL, LLDrawPool::POOL_AVATAR, and LLPipeline::RENDER_TYPE_AVATAR. Definition at line 8463 of file llvoavatar.cpp. References areAllNearbyInstancesBaked(), deleteCachedImages(), end, FALSE, lldebugs, llendl, MIN_PIXEL_AREA_FOR_COMPOSITE, S32, LLCharacter::sInstances, sMaxOtherAvatarsToComposite, and TRUE. Referenced by processAvatarAppearance(), LLViewerObjectList::processObjectUpdate(), setNewBakedTexture(), LLViewerObjectList::updateApparentAngles(), and ~LLVOAvatar(). Definition at line 1293 of file llvoavatar.cpp. References LLTexStaticImageList::deleteCachedImages(), FALSE, gTexStaticImageList, lldebugs, llendl, LLImageGL::sGlobalTextureMemory, LLTexLayerSet::sHasCaches, LLCharacter::sInstances, sScratchTexBytes, sScratchTexLastBindTime, sScratchTexNames, and stop_glerror. Referenced by cullAvatarsByPixelArea(), and destroyGL(). Definition at line 1034 of file llvoavatar.cpp. References LLTexLayerSet::deleteCaches(), mEyesLayerSet, mHeadLayerSet, mLowerBodyLayerSet, mSkirtLayerSet, and mUpperBodyLayerSet. Definition at line 1286 of file llvoavatar.cpp. Definition at line 5885 of file llvoavatar.cpp. References LLInventoryModel::addChangedMask(), FALSE, LLViewerObject::getID(), gInventory, i, LLInventoryObserver::LABEL, lldebugs, llendl, mAttachmentPoints, LLViewerObject::mChildList, LLViewerObject::mID, mIsSelf, LLInventoryModel::notifyObservers(), S32, LLFollowCamMgr::setCameraActive(), stopMotionFromSource(), and TRUE. Definition at line 5695 of file llvoavatar.cpp. Referenced by createDrawable(), idleUpdate(), LLTexLayerSetBuffer::onTextureUploadComplete(), LLTexLayer::renderAlphaMasks(), setNewBakedTexture(), updateJointLODs(), updateVisualParams(), and useBakedTexture(). Definition at line 8389 of file llvoavatar.cpp. References gAgent, gDirUtilp, LLAgent::getAvatarObject(), LLDir::getExpandedFilename(), LLCharacter::getFirstVisualParam(), LLViewerImage::getID(), LLCharacter::getNextVisualParam(), LLViewerObject::getTEImage(), getTEWearableType(), ll_apr_file_open(), LL_APR_WB, LL_PATH_CHARACTER, param, S32, LLUUID::toString(), type, LLWearable::typeToTypeName(), UUID_STR_LENGTH, VISUAL_PARAM_GROUP_TWEAKABLE, WT_EYES, and WT_SHAPE. Definition at line 7594 of file llvoavatar.cpp. References LLViewerImage::getID(), LLViewerObject::getTEImage(), i, IMG_DEFAULT, IMG_DEFAULT_AVATAR, LLUUID::isNull(), llendl, llinfos, mIsSelf, S32, and TEX_NUM_ENTRIES. Definition at line 1075 of file llvoavatar.cpp. References gAgent, LLAgent::getCameraPositionGlobal(), LLNameValue::getString(), IMG_DEFAULT_AVATAR, llcont, llendl, llinfos, LLCharacter::sInstances, sMaxOtherAvatarsToComposite, TEX_EYES_BAKED, TEX_HEAD_BAKED, TEX_LOWER_BAKED, TEX_SKIRT_BAKED, TEX_UPPER_BAKED, and WT_SKIRT. Definition at line 8605 of file llvoavatar.cpp. References LLViewerImage::getDecodePriority(), LLImageGL::getDiscardLevel(), LLImageGL::getHeight(), LLViewerImage::getID(), getID(), LLViewerObject::getTEImage(), LLImageGL::getWidth(), i, IMG_DEFAULT_AVATAR, llendl, llinfos, LOCTEX_NUM_ENTRIES, mLocalTexture, S32, TEX_EYES_BAKED, TEX_HEAD_BAKED, TEX_LOWER_BAKED, TEX_SKIRT_BAKED, and TEX_UPPER_BAKED. Referenced by handle_dump_avatar_local_textures(), and LLAvatarDebug::handleEvent(). Definition at line 1069 of file llvoavatar.cpp. References llendl, llinfos, and sScratchTexBytes. Definition at line 6420 of file llvoavatar.cpp. References llendl, llinfos, S32, and LLCharacter::sInstances. Definition at line 6039 of file llvoavatar.cpp. References LLXform::getParent(), LLViewerObject::isAttachment(), LLPrimitive::isAvatar(), LLViewerObject::isDead(), and NULL. Referenced by LLToolSelect::handleObjectSelection(), LLToolCamera::pickCallback(), and LLToolDragAndDrop::pickCallback(). Definition at line 4591 of file llvoavatar.cpp. References mCollisionVolumes, mNumCollisionVolumes, NULL, and S32. Definition at line 6443 of file llvoavatar.cpp. Referenced by LLPreviewAnim::auditionAnim(), LLFloaterAnimPreview::onBtnOK(), LLPreviewAnim::onClose(), LLFloaterAnimPreview::onCommitEaseIn(), LLFloaterAnimPreview::onCommitEaseOut(), LLFloaterAnimPreview::onCommitEmote(), LLFloaterAnimPreview::onCommitHandPose(), LLFloaterAnimPreview::onCommitLoop(), LLFloaterAnimPreview::onCommitLoopIn(), LLFloaterAnimPreview::onCommitLoopOut(), LLFloaterAnimPreview::onCommitName(), LLFloaterAnimPreview::onCommitPriority(), LLFloaterAnimPreview::onSliderMove(), LLPreviewAnim::playAnim(), LLFloaterAnimPreview::refresh(), LLFloaterAnimPreview::validateEaseIn(), LLFloaterAnimPreview::validateEaseOut(), and writeCAL3D(). Definition at line 6282 of file llvoavatar.cpp. References BAKED_TEXTURE_COUNT, LLTexLayerSet::cancelUpload(), getLayerSet(), gViewerStats, i, LLViewerStats::incStat(), invalidateComposite(), llendl, llinfos, llwarns, S32, sBakedTextureIndices, LLTexLayerSet::setUpdatesEnabled(), LLViewerStats::ST_TEX_REBAKES, TRUE, and updateMeshTextures(). Definition at line 376 of file llvoavatar.h. Definition at line 8082 of file llvoavatar.cpp. References gUserAnimStates, gUserAnimStatesCount, i, LLAnimStateEntry::mLabel, LLDynamicArray< Type, BlockSize >::put(), and S32. Definition at line 8095 of file llvoavatar.cpp. References gUserAnimStates, gUserAnimStatesCount, i, LLAnimStateEntry::mName, LLDynamicArray< Type, BlockSize >::put(), and S32. Definition at line 6091 of file llvoavatar.cpp. References mAttachmentPoints, and LLStringBase< char >::null. Definition at line 9413 of file llvoavatar.cpp. References count, mAttachmentPoints, and S32. Definition at line 7285 of file llvoavatar.cpp. References llassert, mEyesLayerSet, mHeadLayerSet, mLowerBodyLayerSet, mSkirtLayerSet, mUpperBodyLayerSet, TEX_EYES_BAKED, TEX_HEAD_BAKED, TEX_LOWER_BAKED, TEX_SKIRT_BAKED, and TEX_UPPER_BAKED. Referenced by invalidateComposite(), LLTexLayerSetBuffer::needsRender(), and LLTexLayerSetBuffer::onTextureUploadComplete(). Definition at line 4689 of file llvoavatar.cpp. Definition at line 4821 of file llvoavatar.cpp. References mNumJoints, mSkeleton, NULL, and S32. Definition at line 4655 of file llvoavatar.cpp. References LLViewerObject::getPositionAgent(), LLViewerObject::mDrawable, and LLPointer< Type >::notNull(). Definition at line 4671 of file llvoavatar.cpp. Definition at line 4680 of file llvoavatar.cpp. Definition at line 7578 of file llvoavatar.cpp. References LLCharacter::getVisualParamWeight(), LLColor4::mV, teToColorParams(), VX, VY, and VZ. Referenced by LLPanelEditWearable::draw(), and LLPanelEditWearable::onColorCommit(). Definition at line 4604 of file llvoavatar.cpp. References i, mCollisionVolumes, mNumCollisionVolumes, and S32. Definition at line 7686 of file llvoavatar.cpp. References LLControlGroup::getString(), gSavedSettings, IMG_DEFAULT_AVATAR, TEX_EYES_IRIS, TEX_HAIR, TEX_LOWER_JACKET, TEX_LOWER_PANTS, TEX_LOWER_SHOES, TEX_LOWER_SOCKS, TEX_LOWER_UNDERPANTS, TEX_SKIRT, TEX_UPPER_GLOVES, TEX_UPPER_JACKET, TEX_UPPER_SHIRT, and TEX_UPPER_UNDERSHIRT. Referenced by LLWearable::copyDataFrom(), LLWearable::isDirty(), LLWearable::setTexturesToDefaults(), LLGenePool::spawn(), and LLWearable::writeToAvatar(). Definition at line 9444 of file llvoavatar.cpp. References first, LLViewerObject::getNVPair(), and LLNameValue::getString(). Referenced by LLVoiceClient::displayNameFromAvatar(), idleUpdate(), and LLToolPie::pickAndShowMenu(). Definition at line 6171 of file llvoavatar.cpp. References f, LLTexGlobalColor::getColor(), mTexEyeColor, mTexHairColor, and mTexSkinColor. Definition at line 4697 of file llvoavatar.cpp. References f, gAgent, LLAgent::getPosAgentFromGlobal(), LLAgent::getPosGlobalFromAgent(), gNoRender, gWorldPointer, mIsDummy, and LLVector3::setVec(). Definition at line 4742 of file llvoavatar.cpp. Definition at line 7852 of file llvoavatar.cpp. References LLBBox::addBBoxAgent(), LLBBox::addPointLocal(), i, and mAttachmentPoints. Referenced by LLViewerWindow::renderSelections(), LLSelectMgr::renderSilhouettes(), and setup_hud_matrices(). Definition at line 4629 of file llvoavatar.cpp. Referenced by addLocalTextureStats(), canGrabLocalTexture(), LLWearableList::createLegacyWearableFromAvatar(), dumpLocalTextures(), LLVoiceClient::findParticipantByAvatar(), getLocalDiscardLevel(), getLocalTextureGL(), getLocalTextureRaw(), handle_go_to(), LLAvatarTrustNetRate::handleEvent(), LLAvatarSendIM::handleEvent(), LLShowAgentProfile::handleEvent(), LLAvatarAddFriend::handleEvent(), LLAvatarInviteToGroup::handleEvent(), LLAvatarEnableAddFriend::handleEvent(), LLAvatarEject::handleEvent(), LLAvatarDebug::handleEvent(), LLAvatarFreeze::handleEvent(), LLObjectMute::handleEvent(), idleUpdate(), isWearingWearableType(), LLVoiceClient::nameFromAvatar(), LLToolPie::pickAndShowMenu(), LLAgent::processAgentInitialWearablesUpdate(), processAvatarAppearance(), processSingleAnimationStateChange(), LLFloaterAvatarTextures::refresh(), setLocalTexture(), setLocTexTE(), LLVoiceClient::sipURIFromAvatar(), updateCharacter(), updateMeshTextures(), and updateTextures(). Definition at line 4638 of file llvoavatar.cpp. References LLJoint::findJoint(), mRoot, mScreenp, and NULL. Referenced by loadSkeletonNode(), LLVisualParamHint::render(), LLPolySkeletalDistortion::setInfo(), LLPanelEditWearable::setSubpart(), and LLMorphView::updateCamera(). Definition at line 9460 of file llvoavatar.cpp. References mEyesLayerSet, mHeadLayerSet, mLowerBodyLayerSet, mSkirtLayerSet, mUpperBodyLayerSet, NULL, TEX_EYES_BAKED, TEX_EYES_IRIS, TEX_HAIR, TEX_HEAD_BAKED, TEX_HEAD_BODYPAINT, TEX_LOWER_BAKED, TEX_LOWER_BODYPAINT, TEX_LOWER_JACKET, TEX_LOWER_PANTS, TEX_LOWER_SHOES, TEX_LOWER_SOCKS, TEX_LOWER_UNDERPANTS, TEX_SKIRT, TEX_SKIRT_BAKED, TEX_UPPER_BAKED, TEX_UPPER_BODYPAINT, TEX_UPPER_GLOVES, TEX_UPPER_JACKET, TEX_UPPER_SHIRT, and TEX_UPPER_UNDERSHIRT. Referenced by forceBakeAllTextures(), and setLocTexTE(). Definition at line 7185 of file llvoavatar.cpp. References getID(), IMG_DEFAULT_AVATAR, and mLocalTexture. Referenced by isLocalTextureDataAvailable(), and isLocalTextureDataFinal(). Definition at line 6449 of file llvoavatar.cpp. References i, LOCTEX_NUM_ENTRIES, mLocalTexture, and S32. Definition at line 6382 of file llvoavatar.cpp. References FALSE, getID(), IMG_DEFAULT_AVATAR, LOCTEX_NUM_ENTRIES, mLocalTexture, NULL, and TRUE. Referenced by LLTexLayer::render(), and LLTexLayer::renderAlphaMasks(). Definition at line 6407 of file llvoavatar.cpp. Referenced by LLTexLayer::getAlphaData(), and LLTexLayer::renderAlphaMasks(). Definition at line 6356 of file llvoavatar.cpp. References FALSE, getID(), LLViewerObject::getTEImage(), IMG_DEFAULT_AVATAR, LOCTEX_NUM_ENTRIES, mLocalTexture, setLocalTexture(), and TRUE. Definition at line 9499 of file llvoavatar.cpp. References LLViewerRegion::getHost(), LLViewerObject::getRegion(), LLHost::invalid, and LLViewerObject::isDead(). Referenced by onCustomizeEnd(), setNewBakedTexture(), setTETexture(), and updateMeshTextures(). Definition at line 5975 of file llvoavatar.cpp. References ANIM_AGENT_BODY_NOISE, LLQuaternion::DEFAULT, f, FALSE, gAgent, LLAgent::getFrameAgent(), LLViewerObject::getID(), LLXform::getParent(), LLCoordFrame::getQuaternion(), LLViewerObject::getRenderRotation(), LLJoint::getXform(), gPipeline, i, LLPointer< Type >::isNull(), LLPipeline::markMoved(), LLViewerObject::mChildList, LLViewerObject::mDrawable, mIsSelf, mIsSitting, mRoot, LLVector3::mV, LLVector3::normVec(), LLUUID::null, NULL, LLAgent::resetAxes(), S32, LLFollowCamMgr::setCameraActive(), LLXform::setParent(), LLJoint::setPosition(), LLJoint::setRotation(), LLAgent::setSitCamera(), LLAgent::setThirdPersonHeadOffset(), startMotion(), stopMotionFromSource(), TRUE, LLXformMatrix::update(), VZ, and LLVector3::x_axis. Referenced by setParent(), and updateCharacter(). Definition at line 9561 of file llvoavatar.cpp. Definition at line 443 of file llvoavatar.h. Definition at line 4729 of file llvoavatar.cpp. Definition at line 4768 of file llvoavatar.cpp. Definition at line 4760 of file llvoavatar.cpp. Definition at line 377 of file llvoavatar.h. Referenced by LLVisualParamHint::render(), and LLMorphView::updateCamera(). Definition at line 6502 of file llvoavatar.cpp. References LLImageGL::bindExternalTexture(), llassert, NULL, S32, LLImageGL::sGlobalTextureMemory, sScratchTexBytes, sScratchTexNames, stop_glerror, LLImageGL::unbindTexture(), VOAVATAR_SCRATCH_TEX_HEIGHT, and VOAVATAR_SCRATCH_TEX_WIDTH. Definition at line 4304 of file llvoavatar.cpp. References mStepMaterial, mStepOnLand, sStepSoundOnLand, and sStepSounds. Definition at line 5801 of file llvoavatar.cpp. References ATTACHMENT_ID_FROM_STATE, LLViewerObject::getState(), llendl, llwarns, mAttachmentPoints, and S32. Definition at line 7714 of file llvoavatar.cpp. References TEX_EYES_IRIS, TEX_HAIR, TEX_HEAD_BODYPAINT, TEX_LOWER_BODYPAINT, TEX_LOWER_JACKET, TEX_LOWER_PANTS, TEX_LOWER_SHOES, TEX_LOWER_SOCKS, TEX_LOWER_UNDERPANTS, TEX_SKIRT, TEX_UPPER_BODYPAINT, TEX_UPPER_GLOVES, TEX_UPPER_JACKET, TEX_UPPER_SHIRT, TEX_UPPER_UNDERSHIRT, WT_EYES, WT_GLOVES, WT_HAIR, WT_INVALID, WT_JACKET, WT_PANTS, WT_SHIRT, WT_SHOES, WT_SKIN, WT_SKIRT, WT_SOCKS, WT_UNDERPANTS, and WT_UNDERSHIRT. Referenced by LLWearable::copyDataFrom(), dumpArchetypeXML(), LLWearable::isDirty(), LLWearable::isOldVersion(), LLWearable::readFromAvatar(), LLWearable::removeFromAvatar(), LLWearable::setTexturesToDefaults(), LLUndoWearable::setWearable(), LLGenePool::spawn(), and LLWearable::writeToAvatar(). Definition at line 4720 of file llvoavatar.cpp. Definition at line 8440 of file llvoavatar.cpp. References llassert, S32, and LLCharacter::sInstances. Definition at line 4751 of file llvoavatar.cpp. Definition at line 4578 of file llvoavatar.cpp. References LLViewerJointCollisionVolume::getVolumePos(), mCollisionVolumes, mNumCollisionVolumes, and LLVector3::zero. Definition at line 6077 of file llvoavatar.cpp. Referenced by LLPreview::onCommit(), and LLObjectBridge::renameItem(). Definition at line 8505 of file llvoavatar.cpp. References canGrabLocalTexture(), LLViewerImage::getID(), LLViewerObject::getTEImage(), and LLUUID::null. Definition at line 7838 of file llvoavatar.cpp. References FALSE, mAttachmentPoints, and TRUE. Definition at line 7360 of file llvoavatar.cpp. References LLTexLayerSet::getComposite(), mEyesLayerSet, mHeadLayerSet, mLowerBodyLayerSet, mSkirtLayerSet, mUpperBodyLayerSet, and LLTexLayerSetBuffer::uploadPending(). Definition at line 2244 of file llvoavatar.cpp. References LLHUDObject::addHUDObject(), AGENT_STAND_ANIMS, LLHUDText::ALIGN_TEXT_CENTER, LLHUDText::ALIGN_TEXT_LEFT, LLHUDText::ALIGN_VERT_TOP, ANIM_AGENT_AWAY, ANIM_AGENT_BUSY, ANIM_AGENT_CUSTOMIZE, APPEARANCE_MORPH_TIME, LLFontGL::BOLD, BUBBLE_CHAT_TIME, calc_bouncy_animation(), LLAgent::cameraMouselook(), CHAT_FADE_TIME, CHAT_NORMAL_RADIUS, CHAT_TYPE_SHOUT, CHAT_TYPE_WHISPER, clamp_rescale(), LLAgent::clearAFK(), LLVector3::clearVec(), LLHUDManager::createViewerEffect(), dirtyMesh(), f, F_TWO_PI, FADE_DURATION, FALSE, LLFastTimer::FTM_ATTACHMENT_UPDATE, LLFastTimer::FTM_AVATAR_UPDATE, LLFastTimer::FTM_JOINT_UPDATE, gAgent, gCamera, gColors, LLControlGroup::getBOOL(), LLControlGroup::getColor(), LLTrustNet::getConnectionState(), LLTrustNet::getConnectionStateString(), LLVoiceVisualizer::getCurrentGesticulationLevel(), LLVoiceVisualizer::getCurrentlySpeaking(), LLVoiceClient::getCurrentPower(), LLToolMgr::getCurrentTool(), LLTool::getEditingObject(), LLTool::getEditingPointGlobal(), LLAgent::getEffectColor(), LLFrameTimer::getElapsedSeconds(), LLFrameTimer::getElapsedTimeF32(), LLControlGroup::getF32(), LLCharacter::getFirstVisualParam(), getFullname(), getID(), LLCriticalDamp::getInterpolant(), LLVoiceClient::getIsSpeaking(), LLCoordFrame::getLeftAxis(), LLCharacter::getNextVisualParam(), LLViewerObject::getNVPair(), LLCoordFrame::getOrigin(), LLXform::getParent(), LLViewerCamera::getPixelVectors(), LLViewerObject::getPositionAgent(), LLViewerObject::getPositionGlobal(), LLViewerObject::getRegion(), LLXform::getRoot(), LLXform::getRotation(), LLTrustNet::getScore(), LLTrustNet::getScoreColor(), LLTrustNet::getScoreState(), LLSelectMgr::getSelection(), LLCharacter::getSex(), LLNameValue::getString(), LLPrimitive::getVelocity(), LLShaderMgr::getVertexShaderLevel(), LLVoiceClient::getVoiceEnabled(), LLViewerRegion::getWaterHeight(), LLJoint::getWorldPosition(), LLJoint::getWorldRotation(), gGestureManager, gHUDManager, gLastHitNonFloraObjectOffset, gLastHitNonFloraPosGlobal, gMuteListp, gNoRender, gPipeline, gSavedSettings, gSelectMgr, gToolMgr, gTrustNet, gVoiceClient, LLPipeline::hasRenderType(), HOVER_EFFECT_MAX_SPEED, HOVER_EFFECT_STRENGTH, LLViewerObject::idleUpdate(), LLVoiceClient::inProximalChannel(), isAnyAnimationSignaled(), LLViewerObject::isDead(), LLTool::isEditing(), LLMuteList::isMuted(), LLPointer< Type >::isNull(), LLViewerObject::isSelected(), isVisible(), LLFontGL::ITALIC, lazyAttach(), lerp(), LLHUDObject::LL_HUD_EFFECT_BEAM, LLHUDObject::LL_HUD_TEXT, llclamp(), llendl, llfloor(), llinfos, llmax(), llmin(), LLVector3::magVec(), LLViewerObject::mAppAngle, mAppearanceAnimating, mAppearanceAnimSetByUser, mAppearanceMorphTimer, LLPipeline::markMoved(), LLPipeline::markRebuild(), mAttachmentPoints, MAX_BUBBLE_CHAT_UTTERANCES, MAX_STRING, mBeam, mBeamTimer, mBelowWater, mBodySize, mChats, mChatTimer, mCurrentGesticulationLevel, LLViewerObject::mDrawable, mHeadOffset, LLViewerObject::mID, mInAir, mIsBuilt, mIsSelf, mIsSitting, mLastAppearanceBlendTime, mLastVel, mNameAppearance, mNameAway, mNameBusy, mNameMute, mNameString, mNameText, LLAgent::mPointAt, mRippleAccel, mRipplePhase, mRippleTimeLast, mRippleTimer, mRoot, mSignaledAnimations, mTimeVisible, mTitle, mTrustNetScoreState, mTrustNetState, mTrustNetTitleEnabled, LLMemType::MTYPE_AVATAR, mTyping, mTypingTimer, LLVector4::mV, LLVector3::mV, mVisibleChat, mVoiceVisualizer, mWindFreq, mWindVec, needsRenderBeam(), noise1(), LLFontGL::NORMAL, LLVector3::normVec(), LLVector4::normVec(), LLPointer< Type >::notNull(), NULL, NUM_AGENT_STAND_ANIMS, param, projected_vec(), LLDrawable::REBUILD_SHADOW, RENDER_NAME_ALWAYS, RENDER_NAME_FADE, LLPipeline::RENDER_TYPE_AVATAR, LLFrameTimer::reset(), S32, LLVector3::scaleVec(), SELECT_TYPE_HUD, LLAgent::sendAgentSetAppearance(), LLColor4::setAlpha(), setPixelAreaAndAngle(), LLViewerObject::setRotation(), LLVoiceVisualizer::setSpeakingAmplitude(), LLVoiceVisualizer::setStartSpeaking(), LLVoiceVisualizer::setStopSpeaking(), LLVector4::setVec(), LLVoiceVisualizer::setVoiceEnabled(), LLVoiceVisualizer::setVoiceSourceWorldPosition(), LLShaderMgr::SHADER_AVATAR, LLDrawPoolAvatar::SHADER_LEVEL_CLOTH, sJointDebug, LLJoint::sNumTouches, LLJoint::sNumUpdates, sNumVisibleChatBubbles, sRenderGroupTitles, sRenderName, LLFontGL::sSansSerif, LLFontGL::sSansSerifBig, t, TNS_RETRIEVED, TNS_UNKNOWN, LLGestureManager::triggerAndReviseString(), TRUE, TRUSTNET_CONNECTED, TRUSTNET_NO_ADAPTER, u, UNDERWATER_EFFECT_STRENGTH, UNDERWATER_FREQUENCY_DAMP, updateCharacter(), LLPipeline::updateMoveDampedAsync(), LLPipeline::updateMoveNormalAsync(), updateVisualParams(), utf8str_to_wstring(), VISUAL_PARAM_GROUP_TWEAKABLE, VOICE_GESTICULATION_LEVEL_OFF, VW, and VZ. Definition at line 1333 of file llvoavatar.cpp. References LLXmlTree::addAttributeString(), AVATAR_DEFAULT_CHAR, FALSE, gDirUtilp, LLXmlTreeNode::getChildByName(), LLDir::getExpandedFilename(), LLXmlTreeNode::getFastAttributeS32(), LLXmlTreeNode::getFastAttributeString(), LLXmlTree::getRoot(), LLControlGroup::getS32(), gSavedSettings, LLXmlTreeNode::hasName(), LL_PATH_CHARACTER, llassert, llendl, llerrs, LLXmlTree::parseFile(), parseSkeletonFile(), LLVOAvatarSkeletonInfo::parseXml(), LLVOAvatarInfo::parseXmlColorNodes(), LLVOAvatarInfo::parseXmlDriverNodes(), LLVOAvatarInfo::parseXmlLayerNodes(), LLVOAvatarInfo::parseXmlMeshNodes(), LLVOAvatarInfo::parseXmlSkeletonNode(), S32, sAvatarInfo, LLWearable::setCurrentDefinitionVersion(), sMaxOtherAvatarsToComposite, sSkeletonInfo, sSkeletonXMLTree, and sXMLTree. Definition at line 1264 of file llvoavatar.cpp. Definition at line 6194 of file llvoavatar.cpp. References LLAgent::cameraCustomizeAvatar(), gAgent, getBakedTE(), LLViewerImageList::getImage(), LLTexLayerSet::getUpdatesEnabled(), gImageList, IMG_DEFAULT_AVATAR, llassert, mIsSelf, mSavedTE, LLTexLayerSet::requestUpdate(), LLTexLayerSet::requestUpload(), and LLViewerObject::setTEImage(). Referenced by forceBakeAllTextures(), onGlobalColorChanged(), removeMissingBakedTextures(), setLocTexTE(), LLTexParamColor::setWeight(), LLTexLayerParamAlpha::setWeight(), and updateSexDependentLayerSets(). Definition at line 5433 of file llvoavatar.cpp. Definition at line 4478 of file llvoavatar.cpp. References FALSE, i, mSignaledAnimations, S32, and TRUE. Referenced by idleUpdate(), processAnimationStateChanges(), and updateCharacter(). Definition at line 420 of file llvoavatar.h. Definition at line 1013 of file llvoavatar.cpp. References FALSE, LLViewerImage::getID(), LLPrimitive::getNumTEs(), LLViewerObject::getTEImage(), IMG_DEFAULT_AVATAR, isWearingWearableType(), mIsDummy, TEX_EYES_BAKED, TEX_HEAD_BAKED, TEX_LOWER_BAKED, TEX_SKIRT_BAKED, TEX_UPPER_BAKED, TRUE, and WT_SKIRT. Definition at line 7244 of file llvoavatar.cpp. References FALSE, getLocalDiscardLevel(), llassert, LOCTEX_EYES_IRIS, LOCTEX_HEAD_BODYPAINT, LOCTEX_LOWER_BODYPAINT, LOCTEX_LOWER_JACKET, LOCTEX_LOWER_PANTS, LOCTEX_LOWER_SHOES, LOCTEX_LOWER_SOCKS, LOCTEX_LOWER_UNDERPANTS, LOCTEX_SKIRT, LOCTEX_UPPER_BODYPAINT, LOCTEX_UPPER_GLOVES, LOCTEX_UPPER_JACKET, LOCTEX_UPPER_SHIRT, LOCTEX_UPPER_UNDERSHIRT, mEyesLayerSet, mHeadLayerSet, mLowerBodyLayerSet, mSkirtLayerSet, and mUpperBodyLayerSet. Definition at line 7203 of file llvoavatar.cpp. Definition at line 419 of file llvoavatar.h. Referenced by LLHUDEffectLookAt::calcTargetPosition(), LLObjectEnableMute::handleEvent(), loadSkeletonNode(), LLTexLayerSetBuffer::needsRender(), and setParent(). Definition at line 358 of file llvoavatar.h. References FALSE, TEX_EYES_BAKED, TEX_HEAD_BAKED, TEX_LOWER_BAKED, TEX_SKIRT_BAKED, TEX_UPPER_BAKED, and TRUE. Referenced by setLocTexTE(), setTETexture(), LLGenePool::spawn(), and updateTextures(). Definition at line 6434 of file llvoavatar.cpp. References LLViewerObject::mDrawable, and LLPointer< Type >::notNull(). Referenced by idleUpdate(), LLTexLayerSetBuffer::needsRender(), updateCharacter(), and updateTextures(). Definition at line 6060 of file llvoavatar.cpp. Referenced by LLObjectBridge::buildContextMenu(), LLToolDragAndDrop::dad3dGiveInventoryObject(), LLToolDragAndDrop::dad3dRezAttachmentFromInv(), LLToolDragAndDrop::dad3dRezObjectOnLand(), LLToolDragAndDrop::dad3dRezObjectOnObject(), LLFolderBridge::dragCategoryIntoFolder(), LLFolderBridge::dragItemIntoFolder(), LLObjectBridge::getLabelStyle(), LLObjectBridge::getLabelSuffix(), LLToolDragAndDrop::isInventoryGiveAcceptable(), LLToolDragAndDrop::isInventoryGroupGiveAcceptable(), LLObjectBridge::isItemRemovable(), LLFolderBridge::isItemRemovable(), LLGiveable::operator()(), LLDropCopyableItems::operator()(), LLUncopyableItems::operator()(), LLDroppableItem::operator()(), and LLToolDragAndDrop::willObjectAcceptInventory(). Definition at line 7763 of file llvoavatar.cpp. References FALSE, getID(), LLViewerObject::getTEImage(), IMG_DEFAULT_AVATAR, mIsDummy, TEX_LOWER_PANTS, TEX_LOWER_SHOES, TEX_LOWER_SOCKS, TEX_LOWER_UNDERPANTS, TEX_SKIRT, TEX_UPPER_GLOVES, TEX_UPPER_JACKET, TEX_UPPER_SHIRT, TEX_UPPER_UNDERSHIRT, TRUE, WT_EYES, WT_GLOVES, WT_HAIR, WT_JACKET, WT_PANTS, WT_SHAPE, WT_SHIRT, WT_SHOES, WT_SKIN, WT_SKIRT, WT_SOCKS, WT_UNDERPANTS, and WT_UNDERSHIRT. Referenced by LLTexLayerParamAlpha::getSkip(), isFullyBaked(), LLTexLayerSetBuffer::needsRender(), renderTransparent(), updateComposites(), updateLOD(), and writeCAL3D(). Definition at line 5848 of file llvoavatar.cpp. References gAgent, LLAgent::getCameraMode(), mAttachmentPoints, mIsSelf, and updateAttachmentVisibility(). Definition at line 4847 of file llvoavatar.cpp. References LLCharacter::addVisualParam(), buildSkeleton(), FALSE, LLTexLayerSet::isBodyRegion(), llendl, llwarns, loadMeshNodes(), loadSkeletonNode(), LLVOAvatarInfo::mDriverInfoList, mEyesLayerSet, mHeadLayerSet, LLVOAvatarInfo::mLayerInfoList, mLowerBodyLayerSet, mSkirtLayerSet, mTexEyeColor, LLVOAvatarInfo::mTexEyeColorInfo, mTexHairColor, LLVOAvatarInfo::mTexHairColorInfo, mTexSkinColor, LLVOAvatarInfo::mTexSkinColorInfo, mUpperBodyLayerSet, sAvatarInfo, LLDriverParam::setInfo(), LLTexLayerSet::setInfo(), LLTexGlobalColor::setInfo(), sSkeletonInfo, stop_glerror, and TRUE. Definition at line 5164 of file llvoavatar.cpp. References LLCharacter::addSharedVisualParam(), LLCharacter::addVisualParam(), f, FALSE, LLViewerJointMesh::getMesh(), LLPolyMesh::getMesh(), llendl, llwarns, mEyeBallLeftMesh0, mEyeBallLeftMesh1, mEyeBallRightMesh0, mEyeBallRightMesh1, mEyeLashMesh0, mHairMesh0, mHairMesh1, mHairMesh2, mHairMesh3, mHairMesh4, mHairMesh5, mHeadMesh0, mHeadMesh1, mHeadMesh2, mHeadMesh3, mHeadMesh4, mLowerBodyMesh0, mLowerBodyMesh1, mLowerBodyMesh2, mLowerBodyMesh3, mLowerBodyMesh4, mMeshes, LLVOAvatarInfo::mMeshInfoList, mSkirtMesh0, mSkirtMesh1, mSkirtMesh2, mSkirtMesh3, mSkirtMesh4, mUpperBodyMesh0, mUpperBodyMesh1, mUpperBodyMesh2, mUpperBodyMesh3, mUpperBodyMesh4, NULL, param, S32, sAvatarInfo, LLPolyMesh::setAvatar(), LLViewerJointMesh::setColor(), LLViewerJoint::setLOD(), LLViewerJointMesh::setMesh(), TRUE, and type. Definition at line 4992 of file llvoavatar.cpp. References LLJoint::addChild(), LLCharacter::addVisualParam(), DEG_TO_RAD, FALSE, LLJoint::findJoint(), getJoint(), isSelf(), llendl, llwarns, LLVOAvatarInfo::mAttachmentInfoList, mAttachmentPoints, mEyeBallLeftLOD, mEyeBallLeftMesh0, mEyeBallLeftMesh1, mEyeBallRightLOD, mEyeBallRightMesh0, mEyeBallRightMesh1, mEyeLashLOD, mEyeLashMesh0, mHairLOD, mHairMesh0, mHairMesh1, mHairMesh2, mHairMesh3, mHairMesh4, mHairMesh5, mHeadLOD, mHeadMesh0, mHeadMesh1, mHeadMesh2, mHeadMesh3, mHeadMesh4, mLowerBodyLOD, mLowerBodyMesh0, mLowerBodyMesh1, mLowerBodyMesh2, mLowerBodyMesh3, mLowerBodyMesh4, mRoot, LLVOAvatarInfo::mSkeletalDistortionInfoList, mSkeleton, mSkirtLOD, mSkirtMesh0, mSkirtMesh1, mSkirtMesh2, mSkirtMesh3, mSkirtMesh4, LLJoint::mUpdateXform, mUpperBodyLOD, mUpperBodyMesh0, mUpperBodyMesh1, mUpperBodyMesh2, mUpperBodyMesh3, mUpperBodyMesh4, param, S32, sAvatarInfo, LLViewerJointAttachment::setGroup(), LLViewerJointAttachment::setIsHUDAttachment(), LLJoint::setName(), LLViewerJointAttachment::setOriginalPosition(), LLViewerJointAttachment::setPieSlice(), LLQuaternion::setQuat(), LLJoint::setRotation(), LLViewerJointAttachment::setVisibleInFirstPerson(), TRUE, VX, VY, and VZ. Definition at line 997 of file llvoavatar.cpp. References LLViewerObject::markDead(), LLVoiceVisualizer::markDead(), mBeam, mNameText, mVoiceVisualizer, NULL, and sNumVisibleChatBubbles. Definition at line 3724 of file llvoavatar.cpp. References AGENT_STATE_EDITING, FALSE, LLToolMgr::getCurrentTool(), LLToolGrab::getEditingObject(), gNoRender, gSelectMgr, gToolGrab, gToolMgr, LLViewerObject::isAttachment(), LLToolGrab::isEditing(), LLViewerObject::mState, and LLSelectMgr::shouldShowSelection(). Definition at line 8252 of file llvoavatar.cpp. References LLViewerObjectList::findObject(), LLViewerImage::getID(), gObjectList, removeMissingBakedTextures(), and useBakedTexture(). Definition at line 8108 of file llvoavatar.cpp. References LLImageGL::bindExternalTexture(), LLViewerObjectList::findObject(), LLImageBase::getComponents(), LLImageBase::getData(), LLImageBase::getHeight(), LLViewerImage::getID(), LLViewerObject::getTEImage(), LLImageBase::getWidth(), gObjectList, llendl, llerrs, llinfos, llwarns, LLTextureMaskData::mAvatarID, LLTextureMaskData::mLastDiscardLevel, LLMemType::MTYPE_AVATAR, stop_glerror, TEX_HEAD_BAKED, TEX_LOWER_BAKED, and TEX_UPPER_BAKED. Referenced by onFirstTEMessageReceived(), and updateMeshTextures(). Definition at line 7474 of file llvoavatar.cpp. References BAKED_TEXTURE_COUNT, gAgent, LLAgent::getAvatarObject(), LLViewerImageList::getImageFromHost(), getObjectHost(), gImageList, gQuit, i, LLUUID::isNull(), mSavedTE, requestLayerSetUploads(), S32, sBakedTextureIndices, LLAgent::sendAgentSetAppearance(), LLViewerObject::setTEImage(), and updateMeshTextures(). Definition at line 7451 of file llvoavatar.cpp. References BAKED_TEXTURE_COUNT, gAgent, LLAgent::getAvatarObject(), LLViewerImage::getID(), LLViewerImageList::getImage(), LLViewerObject::getTEImage(), gImageList, i, IMG_DEFAULT_AVATAR, mSavedTE, S32, sBakedTextureIndices, LLAgent::sendAgentSetAppearance(), LLViewerObject::setTEImage(), and updateMeshTextures(). Definition at line 7884 of file llvoavatar.cpp. References FALSE, LLViewerImage::getID(), LLViewerObject::getTEImage(), IMG_DEFAULT_AVATAR, MAX_DISCARD_LEVEL, mFirstTEMessageReceived, LLViewerObject::mID, mLastEyesBakedID, mLastHeadBakedID, mLastLowerBodyBakedID, mLastSkirtBakedID, mLastUpperBodyBakedID, MORPH_MASK_REQUESTED_DISCARD, onBakedTextureMasksLoaded(), onInitialBakedTextureLoaded(), LLViewerImage::setLoadedCallback(), LLViewerImage::setNeedsAux(), TEX_EYES_BAKED, TEX_HEAD_BAKED, TEX_LOWER_BAKED, TEX_SKIRT_BAKED, TEX_UPPER_BAKED, TRUE, and updateMeshTextures(). Referenced by processAvatarAppearance(), and processUpdateMessage(). Definition at line 6250 of file llvoavatar.cpp. References LLTexGlobalColor::getColor(), invalidateComposite(), mEyesLayerSet, mHairMesh0, mHairMesh1, mHairMesh2, mHairMesh3, mHairMesh4, mHairMesh5, mHeadLayerSet, mLowerBodyLayerSet, mTexEyeColor, mTexHairColor, mTexSkinColor, mUpperBodyLayerSet, LLColor4::mV, LLViewerJointMesh::setColor(), updateMeshTextures(), VW, VX, VY, and VZ. Definition at line 8237 of file llvoavatar.cpp. References LLViewerObjectList::findObject(), gObjectList, and removeMissingBakedTextures(). Definition at line 6111 of file llvoavatar.cpp. References LLAgent::cameraCustomizeAvatar(), LLViewerObjectList::findObject(), gAgent, LLViewerImage::getID(), gObjectList, LLAvatarTexData::mAvatarID, LLAvatarTexData::mIndex, mLocalTextureDiscard, and LLVisualParamHint::requestHintUpdates(). Definition at line 1459 of file llvoavatar.cpp. 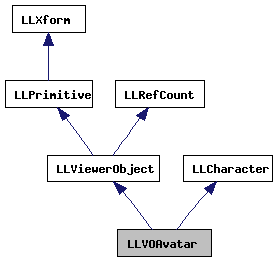 References LLXmlTree::addAttributeString(), FALSE, LLXmlTreeNode::getFastAttributeString(), LLXmlTree::getRoot(), LLXmlTreeNode::hasName(), llendl, llerrs, LLMemType::MTYPE_AVATAR, LLXmlTree::parseFile(), sSkeletonXMLTree, and TRUE. Definition at line 4318 of file llvoavatar.cpp. References AGENT_GUN_AIM_ANIMS, AGENT_WALK_ANIMS, ANIM_AGENT_BODY_NOISE, ANIM_AGENT_FLY_ADJUST, ANIM_AGENT_TARGET, ANIM_AGENT_WALK_ADJUST, FALSE, gNoRender, isAnyAnimationSignaled(), mAnimationSources, mInAir, mIsSelf, mIsSitting, mPlayingAnimations, mSignaledAnimations, LLMemType::MTYPE_AVATAR, NUM_AGENT_GUN_AIM_ANIMS, NUM_AGENT_WALK_ANIMS, processSingleAnimationStateChange(), startMotion(), stop_glerror, stopMotion(), and TRUE. Referenced by buildCharacter(), LLToolsStopAllAnimations::handleEvent(), and process_avatar_animation(). Definition at line 7946 of file llvoavatar.cpp. References _PREHASH_ObjectData, _PREHASH_ParamValue, _PREHASH_VisualParam, cullAvatarsByPixelArea(), f, FALSE, LLCharacter::getFirstVisualParam(), getID(), LLCharacter::getNextVisualParam(), LLMessageSystem::getNumberOfBlocksFast(), LLCharacter::getSex(), LLMessageSystem::getU8Fast(), LLCharacter::getVisualParamWeight(), gNoRender, i, llassert, llendl, llwarns, mFirstAppearanceMessageReceived, mFirstTEMessageReceived, mIsSelf, LLMemType::MTYPE_AVATAR, onFirstTEMessageReceived(), param, S32, setCompositeUpdatesEnabled(), SEX_FEMALE, SEX_MALE, startAppearanceAnimation(), TRUE, U8_to_F32(), LLPrimitive::unpackTEMessage(), updateMeshTextures(), updateSexDependentLayerSets(), updateVisualParams(), and VISUAL_PARAM_GROUP_TWEAKABLE. Definition at line 6314 of file llvoavatar.cpp. References BAKED_TEXTURE_COUNT, FALSE, gAgent, LLAgent::getAvatarObject(), LLMessageSystem::getUUID(), gViewerStats, i, LLViewerStats::incStat(), llendl, llinfos, S32, sBakedTextureIndices, LLViewerStats::ST_TEX_REBAKES, and TRUE. Definition at line 4415 of file llvoavatar.cpp. References ANIM_AGENT_SIT_GROUND_CONSTRAINED, ANIM_AGENT_TYPE, LLViewerParcelMgr::canHearSound(), FALSE, LLMute::flagObjectSounds, gAgent, gAudiop, getCharacterPosition(), LLControlGroup::getF32(), getID(), LLAgent::getPosGlobalFromAgent(), LLControlGroup::getString(), gMuteListp, gParcelMgr, gSavedSettings, LLMuteList::isMuted(), llendl, llwarns, mIsSitting, LLMemType::MTYPE_AVATAR, startMotion(), stopMotion(), and TRUE. Definition at line 2184 of file llvoavatar.cpp. References _PREHASH_ObjectData, FALSE, LLPrimitive::getVelocity(), mFirstTEMessageReceived, mIsSelf, LLMemType::MTYPE_AVATAR, onFirstTEMessageReceived(), OUT_FULL, LLViewerObject::processUpdateMessage(), setCompositeUpdatesEnabled(), TRUE, LLPrimitive::unpackTEMessage(), and updateMeshTextures(). Definition at line 7877 of file llvoavatar.cpp. Definition at line 1978 of file llvoavatar.cpp. References AVATAR_RELEASE_THRESHOLD, FALSE, mAttachmentPoints, LLViewerObject::mDrawable, mEyeBallLeftLOD, mEyeBallRightLOD, mEyeLashLOD, mHairLOD, mHeadLOD, mIsDummy, mLowerBodyLOD, mMeshValid, mSkirtLOD, LLMemType::MTYPE_AVATAR, mUpperBodyLOD, LLPointer< Type >::notNull(), LLViewerJoint::setValid(), LLCharacter::sInstances, and TRUE. Definition at line 5795 of file llvoavatar.cpp. Definition at line 8695 of file llvoavatar.cpp. References BAKED_TEXTURE_COUNT, FALSE, LLViewerImageList::getImage(), LLViewerObject::getTEImage(), gImageList, i, IMG_DEFAULT_AVATAR, invalidateComposite(), mEyesLayerSet, mHeadLayerSet, mIsSelf, mLowerBodyLayerSet, mSkirtLayerSet, mUpperBodyLayerSet, requestLayerSetUploads(), S32, sBakedTextureIndices, LLViewerObject::setTEImage(), TRUE, and updateMeshTextures(). Referenced by onBakedTextureLoaded(), onInitialBakedTextureLoaded(), and updateMeshTextures(). Definition at line 3973 of file llvoavatar.cpp. Definition at line 3937 of file llvoavatar.cpp. References gAgent, LLFace::getRenderColor(), glColor4fv, LLVertexBuffer::MAP_TEXCOORD, LLVertexBuffer::MAP_VERTEX, mIsBuilt, mIsSelf, mShadow0Facep, mShadow1Facep, mShadowImagep, LLColor4::mV, LLAgent::needsRenderAvatar(), LLAgent::needsRenderHead(), and LLFace::renderIndexed(). Definition at line 3912 of file llvoavatar.cpp. References gAgent, mAdjustedPixelArea, mEyeBallLeftLOD, mEyeBallRightLOD, mIsBuilt, mIsSelf, LLAgent::needsRenderAvatar(), LLAgent::needsRenderHead(), and LLViewerJoint::render(). Definition at line 3745 of file llvoavatar.cpp. References AVATAR_RENDER_PASS_SINGLE, COLLISION_TOLERANCE, f, FALSE, FOOT_COLLIDE_FUDGE, gAgent, LLViewerObject::getNVPair(), LLNameValue::getString(), glBegin, glColor4f, glEnd, llendl, llinfos, mAdjustedPixelArea, LLViewerObject::mDrawable, mFootPlane, mHeadLOD, mIsBuilt, mIsSelf, mLowerBodyLOD, mUpperBodyLOD, LLVector3::mV, LLVector4::mV, LLAgent::needsRenderAvatar(), LLAgent::needsRenderHead(), LLPointer< Type >::notNull(), LLViewerJoint::render(), renderTransparent(), sDebugInvisible, LLViewerJointMesh::sRenderPass, sShowFootPlane, TRUE, VW, VX, VY, and VZ. Referenced by LLDrawPoolAvatar::renderAvatars(), and LLDrawPoolAvatar::renderForSelect(). Definition at line 3888 of file llvoavatar.cpp. References f, FALSE, gAgent, isWearingWearableType(), mAdjustedPixelArea, mEyeLashLOD, mHairLOD, mIsSelf, mSkirtLOD, LLAgent::needsRenderHead(), LLViewerJoint::render(), and WT_SKIRT. Definition at line 5703 of file llvoavatar.cpp. References llendl, llerrs, LOCTEX_EYES_IRIS, LOCTEX_HEAD_BODYPAINT, LOCTEX_LOWER_BODYPAINT, LOCTEX_LOWER_JACKET, LOCTEX_LOWER_PANTS, LOCTEX_LOWER_SHOES, LOCTEX_LOWER_SOCKS, LOCTEX_LOWER_UNDERPANTS, LOCTEX_NUM_ENTRIES, LOCTEX_SKIRT, LOCTEX_UPPER_BODYPAINT, LOCTEX_UPPER_GLOVES, LOCTEX_UPPER_JACKET, LOCTEX_UPPER_SHIRT, LOCTEX_UPPER_UNDERSHIRT, mEyesLayerSet, mHeadLayerSet, mLowerBodyLayerSet, mSkirtLayerSet, mUpperBodyLayerSet, and LLTexLayerSet::requestUpdate(). Definition at line 7089 of file llvoavatar.cpp. References LLViewerImage::getID(), LLViewerObject::getTEImage(), IMG_DEFAULT_AVATAR, mEyesLayerSet, mHeadLayerSet, mLowerBodyLayerSet, mSkirtLayerSet, mUpperBodyLayerSet, LLTexLayerSet::requestUpload(), TEX_EYES_BAKED, TEX_HEAD_BAKED, TEX_LOWER_BAKED, TEX_SKIRT_BAKED, and TEX_UPPER_BAKED. Referenced by onCustomizeEnd(), LLAgent::onInitialWearableAssetArrived(), and removeMissingBakedTextures(). Definition at line 4834 of file llvoavatar.cpp. References gAgent, mIsSelf, and LLAgent::requestStopMotion(). Definition at line 4493 of file llvoavatar.cpp. Definition at line 5865 of file llvoavatar.cpp. References gPipeline, LLPipeline::markMoved(), and mAttachmentPoints. Definition at line 4254 of file llvoavatar.cpp. References gAgent, LLAgent::getPosAgentFromGlobal(), LLAgent::getPosGlobalFromAgent(), and resolveHeightGlobal(). Definition at line 4271 of file llvoavatar.cpp. References f, FALSE, gAgent, LLPrimitive::getAngularVelocity(), LLPrimitive::getMaterial(), LLAgent::getPosAgentFromGlobal(), LLViewerObject::getPositionAgent(), LLPrimitive::getVelocity(), gWorldPointer, mStepMaterial, mStepObjectVelocity, mStepOnLand, LLVector3::setVec(), and TRUE. Referenced by resolveHeightAgent(), and updateCharacter(). Definition at line 4264 of file llvoavatar.cpp. Definition at line 1269 of file llvoavatar.cpp. References FALSE, LLCharacter::sInstances, and TRUE. Definition at line 2021 of file llvoavatar.cpp. References gAgent, LLAgent::getCameraMode(), gPipeline, LLPipeline::markRebuild(), mAttachmentPoints, LLViewerObject::mDrawable, mIsSelf, mMeshValid, LLMemType::MTYPE_AVATAR, LLDrawable::REBUILD_GEOMETRY, TRUE, updateAttachmentVisibility(), and updateJointLODs(). Definition at line 7390 of file llvoavatar.cpp. References LLTexLayerSet::cancelUpload(), mEyesLayerSet, mHeadLayerSet, mLowerBodyLayerSet, mSkirtLayerSet, mUpperBodyLayerSet, setTETexture(), TEX_EYES_BAKED, TEX_EYES_IRIS, TEX_HAIR, TEX_HEAD_BAKED, TEX_HEAD_BODYPAINT, TEX_LOWER_BAKED, TEX_LOWER_BODYPAINT, TEX_LOWER_JACKET, TEX_LOWER_PANTS, TEX_LOWER_SHOES, TEX_LOWER_SOCKS, TEX_LOWER_UNDERPANTS, TEX_NUM_ENTRIES, TEX_SKIRT, TEX_SKIRT_BAKED, TEX_UPPER_BAKED, TEX_UPPER_BODYPAINT, TEX_UPPER_GLOVES, TEX_UPPER_JACKET, TEX_UPPER_SHIRT, and TEX_UPPER_UNDERSHIRT. Definition at line 7567 of file llvoavatar.cpp. References LLColor4::mV, LLCharacter::setVisualParamWeight(), teToColorParams(), VX, VY, and VZ. Definition at line 7127 of file llvoavatar.cpp. References mEyesLayerSet, mHeadLayerSet, mLowerBodyLayerSet, mSkirtLayerSet, mUpperBodyLayerSet, and LLTexLayerSet::setUpdatesEnabled(). Referenced by LLAgent::onInitialWearableAssetArrived(), LLAgent::processAgentCachedTextureResponse(), processAvatarAppearance(), and processUpdateMessage(). Definition at line 286 of file llvoavatar.h. Definition at line 7051 of file llvoavatar.cpp. References LLAgent::cameraCustomizeAvatar(), gAgent, LLImageGL::getDiscardLevel(), getID(), LLViewerImage::getID(), IMG_DEFAULT_AVATAR, MAX_DISCARD_LEVEL, mIsSelf, mLocalTexture, mLocalTextureBaked, mLocalTextureDiscard, onLocalTextureLoaded(), LLVisualParamHint::requestHintUpdates(), requestLayerSetUpdate(), S32, LLViewerImage::setLoadedCallback(), LLViewerImage::setMinDiscardLevel(), and TRUE. Referenced by getLocalTextureRaw(), updateMeshTextures(), and useBakedTexture(). Definition at line 6563 of file llvoavatar.cpp. References LLAgent::cameraCustomizeAvatar(), gAgent, LLViewerImage::getID(), getID(), getLayerSet(), LLViewerObject::getTEImage(), invalidateComposite(), isTextureIndexBaked(), llassert, mIsSelf, LLVisualParamHint::requestHintUpdates(), LLViewerObject::setTEImage(), TEX_NUM_ENTRIES, and updateMeshTextures(). Referenced by LLUndoWearable::applyUndoRedo(), LLPanelEditWearable::onTextureCommit(), LLWearable::removeFromAvatar(), LLGenePool::spawn(), and LLWearable::writeToAvatar(). Definition at line 7320 of file llvoavatar.cpp. References cullAvatarsByPixelArea(), dirtyMesh(), gAgent, LLViewerImageList::getImageFromHost(), getObjectHost(), gImageList, hasPendingBakedUploads(), llendl, llinfos, llwarns, LLAgent::sendAgentSetAppearance(), LLViewerObject::setTEImage(), TEX_EYES_BAKED, TEX_HEAD_BAKED, TEX_LOWER_BAKED, TEX_SKIRT_BAKED, TEX_UPPER_BAKED, and updateMeshTextures(). Definition at line 5771 of file llvoavatar.cpp. References gAgent, getOffObject(), isSelf(), NULL, LLAgent::resetCamera(), LLViewerObject::setParent(), and sitOnObject(). Definition at line 5441 of file llvoavatar.cpp. References f, gCamera, LLCamera::getAspect(), LLViewerObject::getMaxScale(), LLViewerObject::getMidScale(), LLCoordFrame::getOrigin(), LLViewerCamera::getPixelMeterRatio(), LLViewerObject::getRenderPosition(), LLXform::getScale(), LLCamera::getViewHeightInPixels(), llmax(), llmin(), LOCTEX_IMAGE_SIZE_SELF, LLViewerObject::mAppAngle, mIsSelf, LLViewerObject::mPixelArea, LLMemType::MTYPE_AVATAR, RAD_TO_DEG, range, VX, VY, and VZ. Definition at line 2223 of file llvoavatar.cpp. References getObjectHost(), LLHost::invalid, isTextureIndexBaked(), and LLViewerObject::setTETextureCore(). Definition at line 1499 of file llvoavatar.cpp. References LLJoint::addChild(), FALSE, getCharacterJoint(), llendl, llwarns, mayaQ(), LLVOAvatarBoneInfo::mChildList, mCollisionVolumes, LLVOAvatarBoneInfo::mIsJoint, LLVOAvatarBoneInfo::mName, mNumCollisionVolumes, LLVOAvatarBoneInfo::mPivot, LLVOAvatarBoneInfo::mPos, LLVOAvatarBoneInfo::mRot, LLVOAvatarBoneInfo::mScale, LLMemType::MTYPE_AVATAR, LLVector3::mV, NULL, S32, sCurJoint, sCurVolume, LLJoint::setName(), LLJoint::setPosition(), LLJoint::setRotation(), LLJoint::setScale(), LLJoint::setSkinOffset(), TRUE, VX, VY, VZ, and LLQuaternion::XYZ. Definition at line 6603 of file llvoavatar.cpp. References LLViewerImage::getID(), LLViewerObject::getTEImage(), IMG_DEFAULT_AVATAR, mEyesLayerSet, mHeadLayerSet, mLowerBodyLayerSet, mSkirtLayerSet, mUpperBodyLayerSet, LLTexLayerSet::setUpdatesEnabled(), TEX_EYES_BAKED, TEX_HEAD_BAKED, TEX_LOWER_BAKED, TEX_SKIRT_BAKED, and TEX_UPPER_BAKED. Definition at line 5933 of file llvoavatar.cpp. References ANIM_AGENT_BODY_NOISE, LLAgent::changeCameraToMouselook(), FALSE, gAgent, LLXform::getPosition(), LLViewerObject::getRenderPosition(), LLViewerObject::getRenderRotation(), LLJoint::getXform(), gPipeline, LLPointer< Type >::isNull(), LLPipeline::markMoved(), LLViewerObject::mDrawable, LLAgent::mForceMouselook, mIsSelf, mIsSitting, mRoot, LLVector3::rotVec(), LLAgent::setFlying(), LLXform::setParent(), LLJoint::setPosition(), LLAgent::setThirdPersonHeadOffset(), LLAgent::setupSitCamera(), LLAgent::startCameraAnimation(), LLAgent::stopAutoPilot(), stopMotion(), TRUE, LLJoint::updateWorldMatrixChildren(), LLFirstUse::useSit(), and LLVector3::zero. Definition at line 3005 of file llvoavatar.cpp. References gAgent, LLViewerObject::getPositionAgent(), gPipeline, LLViewerObject::mDrawable, mRoot, LLPointer< Type >::notNull(), LLXform::setChanged(), LLAgent::setPositionAgent(), LLJoint::setWorldPosition(), LLXform::TRANSLATED, LLPipeline::updateMoveNormalAsync(), and LLJoint::updateWorldMatrixChildren(). Definition at line 8683 of file llvoavatar.cpp. References mAppearanceAnimating, mAppearanceAnimSetByUser, mAppearanceMorphTimer, mLastAppearanceBlendTime, LLFrameTimer::reset(), and TRUE. Referenced by processAvatarAppearance(), LLGenePool::spawn(), and LLWearable::writeToAvatar(). Definition at line 4504 of file llvoavatar.cpp. References ANIM_AGENT_AWAY, ANIM_AGENT_FEMALE_WALK, ANIM_AGENT_SIT, ANIM_AGENT_SIT_FEMALE, ANIM_AGENT_WALK, gAgent, LLCharacter::getSex(), mIsSelf, LLMemType::MTYPE_AVATAR, LLAgent::setAFK(), SEX_FEMALE, and LLCharacter::startMotion(). Referenced by LLPreviewAnim::auditionAnim(), buildCharacter(), getOffObject(), LLFloaterAnimPreview::postBuild(), processAnimationStateChanges(), processSingleAnimationStateChange(), LLFloaterAnimPreview::resetMotion(), and LLMorphView::shutdown(). Definition at line 434 of file llvoavatar.h. References mTyping, mTypingTimer, LLFrameTimer::reset(), and TRUE. Definition at line 4532 of file llvoavatar.cpp. References ANIM_AGENT_FEMALE_WALK, ANIM_AGENT_SIT, ANIM_AGENT_SIT_FEMALE, ANIM_AGENT_WALK, gAgent, mIsSelf, LLAgent::onAnimStop(), and LLCharacter::stopMotion(). Referenced by LLPreviewAnim::auditionAnim(), LLMorphView::initialize(), LLFloaterAnimPreview::onBtnStop(), LLPreviewAnim::onClose(), LLFloaterAnimPreview::onCommitBaseAnim(), LLPreviewAnim::playAnim(), processAnimationStateChanges(), processSingleAnimationStateChange(), LLFloaterAnimPreview::resetMotion(), sitOnObject(), and updateCharacter(). Definition at line 4554 of file llvoavatar.cpp. References ANIM_REQUEST_STOP, LLViewerObjectList::findObject(), FLAGS_ANIM_SOURCE, gAgent, gObjectList, mAnimationSources, LLViewerObject::mFlags, mIsSelf, and LLAgent::sendAnimationRequest(). Referenced by detachObject(), getOffObject(), and LLViewerObject::markDead(). Definition at line 435 of file llvoavatar.h. Definition at line 7500 of file llvoavatar.cpp. References FALSE, llassert, TEX_LOWER_JACKET, TEX_LOWER_PANTS, TEX_LOWER_SHOES, TEX_LOWER_SOCKS, TEX_LOWER_UNDERPANTS, TEX_SKIRT, TEX_UPPER_GLOVES, TEX_UPPER_JACKET, TEX_UPPER_SHIRT, TEX_UPPER_UNDERSHIRT, and TRUE. Referenced by getClothesColor(), setClothesColor(), and LLUndoWearable::setColor(). Definition at line 3683 of file llvoavatar.cpp. References f, llendl, llwarns, LLCharacter::sInstances, sMaxVisible, and sNumVisibleAvatars. Definition at line 7652 of file llvoavatar.cpp. References CAMERA_MODE_MOUSELOOK, FALSE, mAttachmentPoints, sVisibleInFirstPerson, and TRUE. Referenced by attachObject(), LLAgent::endAnimationUpdateUI(), lazyAttach(), restoreMeshData(), and LLAgent::updateCamera(). Definition at line 3021 of file llvoavatar.cpp. References addDebugText(), AGENT_CONTROL_TURN_LEFT, AGENT_CONTROL_TURN_RIGHT, AGENT_NO_ROTATE_ANIMS, angle, angle_between(), ANIM_AGENT_LAND, ANIM_AGENT_RUN, ANIM_AGENT_SIT_GROUND_CONSTRAINED, ANIM_AGENT_WALK, ANIM_AGENT_WALK_ADJUST, LLAgent::cameraMouselook(), LLViewerParcelMgr::canHearSound(), clamp_rescale(), DEG_TO_RAD, DELTA_TIME_MAX, DELTA_TIME_MIN, dot(), f, FALSE, LLMute::flagObjectSounds, FOOT_GROUND_COLLISION_TOLERANCE, LLFastTimer::FTM_UPDATE_ANIMATION, gAgent, gain(), gAudiop, gCamera, gDebugAvatarRotation, LLMotionController::getActiveMotions(), LLCamera::getAspect(), LLCoordFrame::getAtAxis(), LLAgent::getAtAxis(), LLDrawable::getCurrentFrame(), LLTimer::getElapsedTimeF32(), LLQuaternion::getEulerAngles(), LLControlGroup::getF32(), LLAgent::getFlying(), LLMatrix3::getFwdRow(), LLMatrix4::getFwdRow4(), getID(), LLQuaternion::getMatrix3(), getOffObject(), LLXform::getParent(), getPixelArea(), LLAgent::getPosAgentFromGlobal(), LLAgent::getPosGlobalFromAgent(), LLViewerObject::getPositionAgent(), LLViewerObject::getPositionGlobal(), LLAgent::getReferenceUpVector(), LLViewerObject::getRenderPosition(), LLXform::getRotation(), getStepSound(), LLPrimitive::getVelocity(), LLJoint::getWorldMatrix(), LLJoint::getWorldPosition(), LLXform::getWorldPosition(), LLJoint::getWorldRotation(), LLJoint::getXform(), gMuteListp, gNoRender, gParcelMgr, gSavedSettings, gVoiceClient, gWorldPointer, isAnyAnimationSignaled(), LLCharacter::isMotionActive(), LLMuteList::isMuted(), isVisible(), lerp(), llclamp(), llendl, llformat(), llinfos, llmax(), LLVector3::magVec(), mAnimTimer, mBodySize, LLUUID::mData, mDebugText, LLViewerObject::mDrawable, LLVector3d::mdV, mFootLeftp, mFootRightp, mHeadOffset, LLViewerObject::mID, MIN_PIXEL_AREA_FOR_COMPOSITE, mInAir, mIsBuilt, mIsSelf, mIsSitting, LLCharacter::mMotionController, MOUSELOOK_PELVIS_FOLLOW_FACTOR, mPelvisToFoot, LLViewerObject::mPixelArea, mRoot, mScreenp, mSignaledAnimations, mSkullp, mSpeed, mSpeedAccum, LLViewerObject::mText, mTimeInAir, mTimeLast, mTimeVisible, mTurning, LLMemType::MTYPE_AVATAR, LLVector4::mV, LLVector3::mV, mWasOnGroundLeft, mWasOnGroundRight, LLVector3::normVec(), LLPointer< Type >::notNull(), NULL, NUM_AGENT_NO_ROTATE_ANIMS, PELVIS_LAG_FLYING, PELVIS_LAG_MOUSELOOK, PELVIS_LAG_WALKING, PELVIS_ROT_THRESHOLD_FAST, PELVIS_ROT_THRESHOLD_SLOW, projected_vec(), LLMatrix4::quaternion(), RAD_TO_DEG, LLCharacter::removeAnimationData(), LLFrameTimer::reset(), resetHUDAttachments(), resolveHeightAgent(), resolveHeightGlobal(), S32, LLVoiceClient::setAvatarPosition(), LLAgent::setControlFlags(), LLViewerObject::setDebugText(), LLJoint::setPosition(), LLAgent::setPositionAgent(), LLJoint::setRotation(), LLMatrix3::setRows(), LLJoint::setScale(), LLMotionController::setTimeStep(), LLJoint::setWorldPosition(), LLJoint::setWorldRotation(), LLCharacter::sInstances, sitOnObject(), slerp(), sShowAnimationDebug, stopMotion(), t, LLJoint::touch(), LLAudioEngine::triggerSound(), TRUE, u, updateHeadOffset(), LLCharacter::updateMotion(), LLJoint::updateWorldMatrixChildren(), VZ, LLVector3::x_axis, LLVector3::y_axis, LLVector3::z_axis, and LLVector3::zero. Definition at line 6143 of file llvoavatar.cpp. References isWearingWearableType(), mEyesLayerSet, mHeadLayerSet, mLowerBodyLayerSet, mSkirtLayerSet, mUpperBodyLayerSet, LLTexLayerSet::updateComposite(), and WT_SKIRT. Referenced by LLVisualParamHint::preRender(), and LLVisualParamReset::render(). Definition at line 5560 of file llvoavatar.cpp. References LLFastTimer::FTM_UPDATE_AVATAR, gPipeline, LLPipeline::hasRenderType(), llendl, llerrs, mMeshValid, LLPipeline::RENDER_TYPE_AVATAR, and TRUE. Definition at line 3521 of file llvoavatar.cpp. References f, gCamera, LLCamera::getNear(), LLJoint::getWorldPosition(), gFPSClamped, HEAD_MOVEMENT_AVG_TIME, lerp(), llmax(), LLViewerObject::mDrawable, mEyeLeftp, mHeadOffset, mIsSitting, mPelvisToFoot, mRoot, LLVector3::mV, LLPointer< Type >::notNull(), u, and VZ. Referenced by buildCharacter(), updateCharacter(), and updateVisualParams(). Definition at line 5488 of file llvoavatar.cpp. References AVATAR_LOD_TWEAK_RANGE, LLAgent::cameraCustomizeAvatar(), LLAgent::cameraMouselook(), clamp_rescale(), dirtyMesh(), f, FALSE, gAgent, mAdjustedPixelArea, mIsDummy, mIsSelf, LLViewerObject::mPixelArea, mRoot, sLODFactor, sNumLODChangesThisFrame, sNumVisibleAvatars, TRUE, and LLViewerJoint::updateLOD(). Referenced by restoreMeshData(), and updateLOD(). Definition at line 9512 of file llvoavatar.cpp. References FALSE, gAgent, LLFace::getPool(), LLDrawPool::getVertexShaderLevel(), LLPointer< Type >::isNull(), isWearingWearableType(), mDirtyMesh, LLViewerObject::mDrawable, mEyeLashLOD, mHairLOD, mHeadLOD, mIsSelf, mLowerBodyLOD, mSkirtLOD, mUpperBodyLOD, LLFace::mVertexBuffer, LLAgent::needsRenderHead(), LLDrawable::REBUILD_GEOMETRY, LLDrawable::REBUILD_SHADOW, LLVertexBuffer::sEnableVBOs, TRUE, LLViewerJoint::updateGeometry(), updateJointLODs(), updateMeshData(), updateShadowFaces(), and WT_SKIRT. Referenced by LLVisualParamHint::preRender(), LLImagePreviewAvatar::render(), and LLPreviewAnimation::render(). Definition at line 2053 of file llvoavatar.cpp. References llendl, llerrs, mAdjustedPixelArea, LLViewerObject::mDrawable, mEyeBallLeftLOD, mEyeBallRightLOD, mEyeLashLOD, mHairLOD, mHeadLOD, mLowerBodyLOD, mSkirtLOD, mUpperBodyLOD, LLPointer< Type >::notNull(), TRUE, LLViewerJoint::updateFaceData(), and LLViewerJoint::updateFaceSizes(). Definition at line 6638 of file llvoavatar.cpp. References LLAgent::cameraCustomizeAvatar(), LLTexLayerSet::createComposite(), LLTexLayerSet::destroyComposite(), FALSE, gAgent, LLTexGlobalColor::getColor(), LLTexLayerSet::getComposite(), getID(), LLViewerImage::getID(), LLViewerImageList::getImage(), LLViewerImageList::getImageFromHost(), LLPrimitive::getNumTEs(), getObjectHost(), LLViewerObject::getTEImage(), gImageList, gNoRender, i, IMG_DEFAULT, IMG_DEFAULT_AVATAR, LLTexLayerSetBuffer::isInitialized(), LLHost::isOk(), llassert, llendl, llwarns, LOCTEX_EYES_IRIS, LOCTEX_HEAD_BODYPAINT, LOCTEX_LOWER_BODYPAINT, LOCTEX_LOWER_JACKET, LOCTEX_LOWER_PANTS, LOCTEX_LOWER_SHOES, LOCTEX_LOWER_SOCKS, LOCTEX_LOWER_UNDERPANTS, LOCTEX_SKIRT, LOCTEX_UPPER_BODYPAINT, LOCTEX_UPPER_GLOVES, LOCTEX_UPPER_JACKET, LOCTEX_UPPER_SHIRT, LOCTEX_UPPER_UNDERSHIRT, mCulled, mEyeBallLeftMesh0, mEyeBallLeftMesh1, mEyeBallRightMesh0, mEyeBallRightMesh1, mEyeLashMesh0, mEyesBakedLoaded, mEyesLayerSet, mHairMesh0, mHairMesh1, mHairMesh2, mHairMesh3, mHairMesh4, mHairMesh5, mHeadBakedLoaded, mHeadLayerSet, mHeadMaskDiscard, mHeadMesh0, mHeadMesh1, mHeadMesh2, mHeadMesh3, mHeadMesh4, LLViewerObject::mID, mIsSelf, mLastEyesBakedID, mLastHeadBakedID, mLastLowerBodyBakedID, mLastSkirtBakedID, mLastUpperBodyBakedID, mLowerBakedLoaded, mLowerBodyLayerSet, mLowerBodyMesh0, mLowerBodyMesh1, mLowerBodyMesh2, mLowerBodyMesh3, mLowerBodyMesh4, mLowerMaskDiscard, MORPH_MASK_REQUESTED_DISCARD, mSkirtBakedLoaded, mSkirtLayerSet, mSkirtMesh0, mSkirtMesh1, mSkirtMesh2, mSkirtMesh3, mSkirtMesh4, mTexHairColor, mUpperBakedLoaded, mUpperBodyLayerSet, mUpperBodyMesh0, mUpperBodyMesh1, mUpperBodyMesh2, mUpperBodyMesh3, mUpperBodyMesh4, mUpperMaskDiscard, LLColor4::mV, NULL, onBakedTextureLoaded(), onBakedTextureMasksLoaded(), removeMissingBakedTextures(), LLViewerJointMesh::setColor(), LLViewerJointMesh::setLayerSet(), LLViewerImage::setLoadedCallback(), setLocalTexture(), LLViewerImage::setNeedsAux(), LLViewerObject::setTEImage(), LLViewerJointMesh::setTexture(), LLTexLayerSet::setUpdatesEnabled(), SWITCH_TO_BAKED_DISCARD, TEX_EYES_BAKED, TEX_EYES_IRIS, TEX_HAIR, TEX_HEAD_BAKED, TEX_HEAD_BODYPAINT, TEX_LOWER_BAKED, TEX_LOWER_BODYPAINT, TEX_LOWER_JACKET, TEX_LOWER_PANTS, TEX_LOWER_SHOES, TEX_LOWER_SOCKS, TEX_LOWER_UNDERPANTS, TEX_SKIRT, TEX_SKIRT_BAKED, TEX_UPPER_BAKED, TEX_UPPER_BODYPAINT, TEX_UPPER_GLOVES, TEX_UPPER_JACKET, TEX_UPPER_SHIRT, TEX_UPPER_UNDERSHIRT, TRUE, useBakedTexture(), VW, VX, VY, and VZ. Referenced by forceBakeAllTextures(), onCustomizeEnd(), onCustomizeStart(), onFirstTEMessageReceived(), onGlobalColorChanged(), LLAgent::processAgentCachedTextureResponse(), processAvatarAppearance(), processUpdateMessage(), LLWearable::removeFromAvatar(), removeMissingBakedTextures(), setLocTexTE(), setNewBakedTexture(), LLGenePool::spawn(), updateSexDependentLayerSets(), and LLWearable::writeToAvatar(). Definition at line 9420 of file llvoavatar.cpp. References LLFrameTimer::getElapsedTimeF32(), LLViewerRegion::getHandle(), LLViewerStats::getStat(), gViewerStats, llmax(), mIsSelf, mLastRegionHandle, mRegionCrossingCount, mRegionCrossingTimer, LLFrameTimer::reset(), LLViewerStats::setStat(), LLViewerStats::ST_CROSSING_AVG, and LLViewerStats::ST_CROSSING_MAX. Definition at line 5684 of file llvoavatar.cpp. References invalidateComposite(), mHeadLayerSet, mLowerBodyLayerSet, mUpperBodyLayerSet, and updateMeshTextures(). Referenced by LLUndoWearable::applyUndoRedo(), LLPanelEditWearable::onCommitSexChange(), processAvatarAppearance(), and LLWearable::writeToAvatar(). Definition at line 5584 of file llvoavatar.cpp. References azimuth(), CAMERA_MODE_MOUSELOOK, clamp_rescale(), f, FALSE, gAgent, LLAgent::getCameraMode(), LLAgent::getPosAgentFromGlobal(), LLAgent::getPosGlobalFromAgent(), LLSky::getSunDirection(), LLJoint::getWorldPosition(), gSky, MAX_SHADOW_HEIGHT, mFootLeftp, mFootRightp, MIN_SHADOW_HEIGHT, mInAir, mIsSelf, mKneeLeftp, mKneeRightp, mShadow0Facep, mShadow1Facep, mShadowImageID, mShadowImagep, LLVector3::mV, LLSky::mVOSkyp, projected_vec(), resolveRayCollisionAgent(), LLSprite::setColor(), LLSprite::setFollow(), LLSprite::setNormal(), LLSprite::setPosition(), LLSprite::setSize(), LLFace::setSize(), LLSprite::setYaw(), SHADOW_OFFSET_AMT, LLSprite::updateFace(), and VZ. Definition at line 1443 of file llvoavatar.cpp. References f, LLViewerObject::getRenderPosition(), LLXform::getScale(), LLViewerObject::mDrawable, LLVector3::setVec(), and size. Definition at line 3984 of file llvoavatar.cpp. References addBakedTextureStats(), addLocalTextureStats(), LLUUID::asString(), LLViewerImage::bind(), LLViewerImage::BOOST_AVATAR, LLViewerImage::BOOST_AVATAR_BAKED, LLViewerImage::BOOST_AVATAR_BAKED_SELF, LLViewerImage::BOOST_AVATAR_SELF, fsqrtf, LLViewerRegion::getHost(), getID(), LLViewerImage::getID(), LLPrimitive::getNumTEs(), LLViewerObject::getRegion(), LLPrimitive::getTE(), LLViewerObject::getTEImage(), gGLManager, gNoRender, gPipeline, LLPipeline::hasRenderDebugMask(), i, IMG_DEFAULT_AVATAR, isTextureIndexBaked(), isVisible(), llassert, llendl, llformat(), llwarns, LOCTEX_EYES_IRIS, LOCTEX_HEAD_BODYPAINT, LOCTEX_LOWER_BODYPAINT, LOCTEX_LOWER_JACKET, LOCTEX_LOWER_PANTS, LOCTEX_LOWER_SHOES, LOCTEX_LOWER_SOCKS, LOCTEX_LOWER_UNDERPANTS, LOCTEX_SKIRT, LOCTEX_UPPER_BODYPAINT, LOCTEX_UPPER_GLOVES, LOCTEX_UPPER_JACKET, LOCTEX_UPPER_SHIRT, LOCTEX_UPPER_UNDERSHIRT, mCulled, mEyesBakedLoaded, mHeadBakedLoaded, LLGLManager::mIsDisabled, mIsDummy, mIsSelf, mLowerBakedLoaded, mMaxPixelArea, mMinPixelArea, LLViewerObject::mPixelArea, LLTextureEntry::mScaleS, LLTextureEntry::mScaleT, mShadowImagep, mSkirtBakedLoaded, mUpperBakedLoaded, LLPipeline::RENDER_DEBUG_TEXTURE_AREA, S32, LLViewerObject::setDebugText(), TEX_EYES_BAKED, TEX_EYES_IRIS, TEX_HAIR, TEX_HEAD_BAKED, TEX_HEAD_BODYPAINT, TEX_LOWER_BAKED, TEX_LOWER_BODYPAINT, TEX_LOWER_JACKET, TEX_LOWER_PANTS, TEX_LOWER_SHOES, TEX_LOWER_SOCKS, TEX_LOWER_UNDERPANTS, TEX_SKIRT, TEX_SKIRT_BAKED, TEX_UPPER_BAKED, TEX_UPPER_BODYPAINT, TEX_UPPER_GLOVES, TEX_UPPER_JACKET, TEX_UPPER_SHIRT, TEX_UPPER_UNDERSHIRT, and TRUE. Definition at line 3546 of file llvoavatar.cpp. References LLAgent::areWearablesLoaded(), FALSE, gAgent, gCamera, LLFrameTimer::getElapsedTimeF32(), LLViewerObject::getNVPair(), LLViewerObject::getPositionAgent(), LLNameValue::getString(), LLPointer< Type >::isNull(), llendl, llinfos, mAttachmentPoints, LLViewerObject::mDrawable, mFirstAppearanceMessageReceived, mIsDummy, mIsSelf, mMeshInvisibleTime, mMeshValid, mVisible, releaseMeshData(), LLFrameTimer::reset(), restoreMeshData(), sDebugInvisible, TIME_BEFORE_MESH_CLEANUP, and TRUE. Definition at line 5408 of file llvoavatar.cpp. References computeBodySize(), dirtyMesh(), f, LLCharacter::getVisualParamWeight(), gNoRender, mLastSkeletonSerialNum, mRoot, LLCharacter::mSkeletonSerialNum, LLCharacter::setSex(), SEX_FEMALE, SEX_MALE, updateHeadOffset(), LLCharacter::updateVisualParams(), and LLJoint::updateWorldMatrixChildren(). Referenced by LLUndoWearable::applyUndoRedo(), LLAgent::clearVisualParams(), idleUpdate(), LLPanelEditWearable::onCommitSexChange(), LLScrollingPanelParam::onHintHeldDown(), LLScrollingPanelParam::onSliderMoved(), LLVisualParamHint::preRender(), processAvatarAppearance(), LLWearable::removeFromAvatar(), LLVisualParamReset::render(), LLGenePool::spawn(), writeCAL3D(), and LLWearable::writeToAvatar(). Definition at line 8278 of file llvoavatar.cpp. References LLTexLayerSet::destroyComposite(), dirtyMesh(), LLViewerImage::getID(), LLViewerObject::getTEImage(), LOCTEX_EYES_IRIS, LOCTEX_HEAD_BODYPAINT, LOCTEX_LOWER_BODYPAINT, LOCTEX_LOWER_JACKET, LOCTEX_LOWER_PANTS, LOCTEX_LOWER_SHOES, LOCTEX_LOWER_SOCKS, LOCTEX_LOWER_UNDERPANTS, LOCTEX_SKIRT, LOCTEX_UPPER_BODYPAINT, LOCTEX_UPPER_GLOVES, LOCTEX_UPPER_JACKET, LOCTEX_UPPER_SHIRT, LOCTEX_UPPER_UNDERSHIRT, mEyeBallLeftMesh0, mEyeBallLeftMesh1, mEyeBallRightMesh0, mEyeBallRightMesh1, mEyeLashMesh0, mEyesBakedLoaded, mEyesLayerSet, mHeadBakedLoaded, mHeadLayerSet, mHeadMesh0, mHeadMesh1, mHeadMesh2, mHeadMesh3, mHeadMesh4, mLastEyesBakedID, mLastHeadBakedID, mLastLowerBodyBakedID, mLastSkirtBakedID, mLastUpperBodyBakedID, mLowerBakedLoaded, mLowerBodyLayerSet, mLowerBodyMesh0, mLowerBodyMesh1, mLowerBodyMesh2, mLowerBodyMesh3, mLowerBodyMesh4, mSkirtBakedLoaded, mSkirtLayerSet, mSkirtMesh0, mSkirtMesh1, mSkirtMesh2, mSkirtMesh3, mSkirtMesh4, mUpperBakedLoaded, mUpperBodyLayerSet, mUpperBodyMesh0, mUpperBodyMesh1, mUpperBodyMesh2, mUpperBodyMesh3, mUpperBodyMesh4, setLocalTexture(), LLViewerJointMesh::setTexture(), TEX_EYES_BAKED, TEX_EYES_IRIS, TEX_HEAD_BAKED, TEX_HEAD_BODYPAINT, TEX_LOWER_BAKED, TEX_LOWER_BODYPAINT, TEX_LOWER_JACKET, TEX_LOWER_PANTS, TEX_LOWER_SHOES, TEX_LOWER_SOCKS, TEX_LOWER_UNDERPANTS, TEX_SKIRT, TEX_SKIRT_BAKED, TEX_UPPER_BAKED, TEX_UPPER_BODYPAINT, TEX_UPPER_GLOVES, TEX_UPPER_JACKET, TEX_UPPER_SHIRT, TEX_UPPER_UNDERSHIRT, and TRUE. Referenced by onBakedTextureLoaded(), and updateMeshTextures(). Definition at line 9167 of file llvoavatar.cpp. References ANIM_AGENT_FEMALE_WALK, ANIM_AGENT_WALK, BAKED_TEXTURE_COUNT, f, FALSE, findMotion(), LLTexGlobalColor::getColor(), LLImageGL::getHasGLTexture(), LLVOAvatarSkeletonInfo::getNumBones(), LLVOAvatarSkeletonInfo::getNumCollisionVolumes(), LLJoint::getParent(), LLCharacter::getSex(), LLJoint::getSkinOffset(), i, isWearingWearableType(), ll_apr_file_open(), LL_APR_W, LL_PCODE_VOLUME, llendl, llinfos, llwarns, mAttachmentPoints, mEyeBallLeftMesh0, mEyeBallRightMesh0, mEyeLashMesh0, mHairMesh0, mHeadMesh0, mLowerBodyMesh0, mRoot, mSkirtMesh0, LLViewerObject::mTEImages, mTexHairColor, mUpperBodyMesh0, LLColor4U::mV, LLImageGL::readBackRaw(), S32, sBakedTextureIndices, LLCharacter::setVisualParamWeight(), SEX_MALE, sSkeletonInfo, TEX_HAIR, updateVisualParams(), VW, VX, VY, VZ, LLColor4U::white, LLKeyframeMotion::writeCAL3D(), LLViewerJointMesh::writeCAL3D(), LLViewerJoint::writeCAL3D(), and WT_SKIRT. Definition at line 882 of file llvoavatar.h. Referenced by renderRigid(), renderSkinned(), renderTransparent(), updateJointLODs(), and updateMeshData(). Definition at line 726 of file llvoavatar.h. Referenced by process_avatar_animation(), processAnimationStateChanges(), stopMotionFromSource(), and ~LLVOAvatar(). Definition at line 708 of file llvoavatar.h. Definition at line 615 of file llvoavatar.h. Referenced by buildCharacter(), and computeBodySize(). Definition at line 616 of file llvoavatar.h. Definition at line 813 of file llvoavatar.h. Referenced by idleUpdate(), LLVisualParamHint::needsRender(), LLTexLayerSetBuffer::needsRender(), and startAppearanceAnimation(). Definition at line 811 of file llvoavatar.h. Referenced by idleUpdate(), and startAppearanceAnimation(). Definition at line 810 of file llvoavatar.h. Definition at line 849 of file llvoavatar.h. Referenced by buildCharacter(), LLObjectBridge::buildContextMenu(), clampAttachmentPositions(), detachObject(), getAttachedPointName(), getAttachmentCount(), getHUDBBox(), getTargetAttachmentPoint(), getWornAttachment(), handle_dump_attachments(), LLAttachmentEnableDrop::handleEvent(), LLObjectAttachToAvatar::handleEvent(), LLAttachObject::handleEvent(), hasHUDAttachment(), idleUpdate(), isWearingAttachment(), lazyAttach(), LLMakeOutfitDialog::LLMakeOutfitDialog(), loadSkeletonNode(), near_attach_object(), releaseMeshData(), LLPipeline::renderForSelect(), LLViewerObjectList::renderObjectsForSelect(), resetHUDAttachments(), restoreMeshData(), rez_attachment(), LLSelectMgr::sendAttach(), updateAttachmentVisibility(), updateVisibility(), LLAgent::userRemoveAllAttachments(), writeCAL3D(), and ~LLVOAvatar(). Definition at line 589 of file llvoavatar.h. Definition at line 877 of file llvoavatar.h. Referenced by idleUpdate(), and markDead(). Definition at line 878 of file llvoavatar.h. Definition at line 805 of file llvoavatar.h. Definition at line 760 of file llvoavatar.h. Referenced by computeBodySize(), idleUpdate(), and updateCharacter(). Definition at line 783 of file llvoavatar.h. Referenced by addChat(), clearChat(), and idleUpdate(). Definition at line 784 of file llvoavatar.h. Referenced by addChat(), and idleUpdate(). Definition at line 605 of file llvoavatar.h. Definition at line 598 of file llvoavatar.h. Referenced by allocateCollisionVolumes(), findCollisionVolume(), getCollisionVolumeID(), getVolumePos(), LLVOAvatar(), renderCollisionVolumes(), LLPolyMorphTarget::setInfo(), setupBone(), and ~LLVOAvatar(). Definition at line 926 of file llvoavatar.h. Referenced by isCulled(), updateMeshTextures(), and updateTextures(). Definition at line 972 of file llvoavatar.h. Referenced by idleUpdate(), and LLVOAvatar(). Definition at line 896 of file llvoavatar.h. Referenced by addDebugText(), and updateCharacter(). Definition at line 574 of file llvoavatar.h. Referenced by dirtyMesh(), LLVOAvatar(), and updateLOD(). Definition at line 879 of file llvoavatar.h. Definition at line 664 of file llvoavatar.h. Referenced by LLVOAvatar(), loadSkeletonNode(), releaseMeshData(), renderRigid(), and updateMeshData(). Definition at line 665 of file llvoavatar.h. Referenced by buildCharacter(), LLVOAvatar(), loadMeshNodes(), loadSkeletonNode(), updateMeshTextures(), useBakedTexture(), and writeCAL3D(). Definition at line 666 of file llvoavatar.h. Referenced by buildCharacter(), LLVOAvatar(), loadMeshNodes(), loadSkeletonNode(), updateMeshTextures(), and useBakedTexture(). Definition at line 668 of file llvoavatar.h. Definition at line 669 of file llvoavatar.h. Definition at line 670 of file llvoavatar.h. Definition at line 647 of file llvoavatar.h. Referenced by LLVOAvatar(), loadSkeletonNode(), releaseMeshData(), renderTransparent(), updateLOD(), and updateMeshData(). Definition at line 648 of file llvoavatar.h. Definition at line 609 of file llvoavatar.h. Referenced by buildCharacter(), and updateHeadOffset(). Definition at line 610 of file llvoavatar.h. Definition at line 918 of file llvoavatar.h. Referenced by updateMeshTextures(), updateTextures(), and useBakedTexture(). Definition at line 872 of file llvoavatar.h. Referenced by deleteLayerSetCaches(), getBakedTE(), getLayerSet(), hasPendingBakedUploads(), isLocalTextureDataAvailable(), isLocalTextureDataFinal(), loadAvatar(), onGlobalColorChanged(), removeMissingBakedTextures(), requestLayerSetUpdate(), requestLayerSetUploads(), setCachedBakedTexture(), setCompositeUpdatesEnabled(), setupComposites(), updateComposites(), updateMeshTextures(), useBakedTexture(), and ~LLVOAvatar(). Definition at line 910 of file llvoavatar.h. Referenced by processAvatarAppearance(), and updateVisibility(). Definition at line 909 of file llvoavatar.h. Referenced by onFirstTEMessageReceived(), processAvatarAppearance(), and processUpdateMessage(). Definition at line 617 of file llvoavatar.h. Referenced by buildCharacter(), computeBodySize(), updateCharacter(), and updateShadowFaces(). Definition at line 747 of file llvoavatar.h. Referenced by process_agent_movement_complete(), renderSkinned(), LLWorld::resolveStepHeightGlobal(), and setFootPlane(). Definition at line 618 of file llvoavatar.h. Referenced by buildCharacter(), updateCharacter(), and updateShadowFaces(). Definition at line 632 of file llvoavatar.h. Definition at line 633 of file llvoavatar.h. Referenced by buildCharacter(), LLVOAvatar(), loadMeshNodes(), loadSkeletonNode(), onGlobalColorChanged(), updateMeshTextures(), and writeCAL3D(). Definition at line 634 of file llvoavatar.h. Referenced by buildCharacter(), LLVOAvatar(), loadMeshNodes(), loadSkeletonNode(), onGlobalColorChanged(), and updateMeshTextures(). Definition at line 635 of file llvoavatar.h. Definition at line 636 of file llvoavatar.h. Definition at line 637 of file llvoavatar.h. Definition at line 638 of file llvoavatar.h. Definition at line 912 of file llvoavatar.h. Definition at line 869 of file llvoavatar.h. Referenced by deleteLayerSetCaches(), getBakedTE(), getLayerSet(), hasPendingBakedUploads(), isLocalTextureDataAvailable(), isLocalTextureDataFinal(), loadAvatar(), onGlobalColorChanged(), removeMissingBakedTextures(), requestLayerSetUpdate(), requestLayerSetUploads(), setCachedBakedTexture(), setCompositeUpdatesEnabled(), setupComposites(), updateComposites(), updateMeshTextures(), updateSexDependentLayerSets(), useBakedTexture(), and ~LLVOAvatar(). Definition at line 640 of file llvoavatar.h. Referenced by LLVOAvatar(), loadSkeletonNode(), releaseMeshData(), renderSkinned(), updateLOD(), and updateMeshData(). Definition at line 913 of file llvoavatar.h. Definition at line 922 of file llvoavatar.h. Definition at line 641 of file llvoavatar.h. Referenced by buildCharacter(), getHeadMesh(), LLVOAvatar(), loadMeshNodes(), loadSkeletonNode(), updateMeshTextures(), useBakedTexture(), and writeCAL3D(). Definition at line 642 of file llvoavatar.h. Definition at line 643 of file llvoavatar.h. Definition at line 644 of file llvoavatar.h. Definition at line 645 of file llvoavatar.h. Definition at line 766 of file llvoavatar.h. Referenced by idleUpdate(), updateCharacter(), and updateHeadOffset(). Definition at line 607 of file llvoavatar.h. Referenced by buildCharacter(), LLHUDEffectLookAt::calcTargetPosition(), computeBodySize(), LLVOAvatar(), and LLPreviewAnimation::render(). Definition at line 611 of file llvoavatar.h. Definition at line 612 of file llvoavatar.h. Definition at line 627 of file llvoavatar.h. Referenced by LLSelectMgr::getAgentHUDZoom(), LLManip::getMousePointOnPlaneGlobal(), LLManip::getSubdivisionLevel(), LLManipTranslate::highlightManipulators(), LLManipScale::highlightManipulators(), LLManipRotate::mouseToRay(), LLManip::nearestPointOnLineFromMouse(), LLManipTranslate::render(), LLManipScale::render(), LLManipRotate::render(), render_ui_2d(), LLSelectNode::renderOneSilhouette(), LLViewerWindow::renderSelections(), LLSelectMgr::renderSilhouettes(), LLManipTranslate::renderSnapGuides(), LLManip::renderTickText(), LLManip::renderTickValue(), LLManipTranslate::renderTranslationHandles(), LLSelectMgr::resetAgentHUDZoom(), LLSelectMgr::setAgentHUDZoom(), setup_hud_matrices(), LLSelectMgr::updateSelectionCenter(), LLManipScale::updateSnapGuides(), and LLManipRotate::updateVisiblity(). Definition at line 626 of file llvoavatar.h. Referenced by LLSelectMgr::getAgentHUDZoom(), LLSelectMgr::resetAgentHUDZoom(), LLSelectMgr::setAgentHUDZoom(), setup_hud_matrices(), and LLSelectMgr::updateSelectionCenter(). Definition at line 739 of file llvoavatar.h. Referenced by idleUpdate(), LLVOAvatar(), processAnimationStateChanges(), updateCharacter(), and updateShadowFaces(). Definition at line 584 of file llvoavatar.h. Referenced by buildCharacter(), idleUpdate(), LLVOAvatar(), renderFootShadows(), renderRigid(), renderSkinned(), and updateCharacter(). Definition at line 702 of file llvoavatar.h. Referenced by getGround(), getPixelArea(), isFullyBaked(), isWearingWearableType(), releaseMeshData(), LLDrawPoolAvatar::renderForSelect(), updateJointLODs(), updateTextures(), and updateVisibility(). Definition at line 685 of file llvoavatar.h. Referenced by addLocalTextureStats(), attachObject(), buildCharacter(), buildSkeleton(), LLTexLayerSet::createComposite(), detachObject(), dumpAvatarTEs(), getOffObject(), idleUpdate(), invalidateComposite(), isSelf(), lazyAttach(), LLVOAvatar(), LLToolCamera::pickCallback(), process_avatar_animation(), processAnimationStateChanges(), processAvatarAppearance(), processUpdateMessage(), removeMissingBakedTextures(), LLTexLayerParamAlpha::render(), LLTexLayer::renderAlphaMasks(), LLDrawPoolAvatar::renderAvatars(), renderFootShadows(), renderRigid(), renderSkinned(), renderTransparent(), requestStopMotion(), restoreMeshData(), setLocalTexture(), setLocTexTE(), setPixelAreaAndAngle(), sitOnObject(), startMotion(), stopMotion(), stopMotionFromSource(), updateCharacter(), updateJointLODs(), updateLOD(), updateMeshTextures(), updateRegion(), updateShadowFaces(), updateTextures(), updateVisibility(), and ~LLVOAvatar(). Definition at line 776 of file llvoavatar.h. Referenced by LLViewerKeyboard::getMode(), getOffObject(), LLSelfEnableStandUp::handleEvent(), idleUpdate(), process_avatar_sit_response(), processAnimationStateChanges(), processSingleAnimationStateChange(), LLOverlayBar::refresh(), sitOnObject(), sitting_on_selection(), updateCharacter(), and updateHeadOffset(). Definition at line 613 of file llvoavatar.h. Referenced by buildCharacter(), computeBodySize(), and updateShadowFaces(). Definition at line 614 of file llvoavatar.h. Referenced by buildCharacter(), and updateShadowFaces(). Definition at line 812 of file llvoavatar.h. Definition at line 696 of file llvoavatar.h. Referenced by onFirstTEMessageReceived(), updateMeshTextures(), and useBakedTexture(). Definition at line 693 of file llvoavatar.h. Definition at line 695 of file llvoavatar.h. Definition at line 897 of file llvoavatar.h. Definition at line 761 of file llvoavatar.h. Definition at line 697 of file llvoavatar.h. Definition at line 694 of file llvoavatar.h. Definition at line 804 of file llvoavatar.h. Definition at line 905 of file llvoavatar.h. Referenced by addLocalTextureStats(), dumpLocalTextures(), getLocalDiscardLevel(), getLocalTextureByteCount(), getLocalTextureGL(), getLocalTextureID(), getLocalTextureRaw(), and setLocalTexture(). Definition at line 906 of file llvoavatar.h. Referenced by LLVOAvatar(), and setLocalTexture(). Definition at line 907 of file llvoavatar.h. Referenced by LLVOAvatar(), onLocalTextureLoaded(), and setLocalTexture(). Definition at line 916 of file llvoavatar.h. Definition at line 871 of file llvoavatar.h. Definition at line 657 of file llvoavatar.h. Definition at line 658 of file llvoavatar.h. Definition at line 659 of file llvoavatar.h. Definition at line 660 of file llvoavatar.h. Definition at line 661 of file llvoavatar.h. Definition at line 662 of file llvoavatar.h. Definition at line 917 of file llvoavatar.h. Definition at line 924 of file llvoavatar.h. Definition at line 928 of file llvoavatar.h. Referenced by addBakedTextureStats(), and updateTextures(). Definition at line 680 of file llvoavatar.h. Referenced by loadMeshNodes(), and ~LLVOAvatar(). Definition at line 793 of file llvoavatar.h. Definition at line 791 of file llvoavatar.h. Referenced by buildCharacter(), releaseMeshData(), restoreMeshData(), updateGeometry(), and updateVisibility(). Definition at line 927 of file llvoavatar.h. Definition at line 889 of file llvoavatar.h. Definition at line 886 of file llvoavatar.h. Definition at line 887 of file llvoavatar.h. Definition at line 888 of file llvoavatar.h. Definition at line 884 of file llvoavatar.h. Definition at line 782 of file llvoavatar.h. Definition at line 606 of file llvoavatar.h. Definition at line 597 of file llvoavatar.h. Referenced by allocateCollisionVolumes(), findCollisionVolume(), getCollisionVolumeID(), getVolumePos(), LLVOAvatar(), renderCollisionVolumes(), LLPolyMorphTarget::setInfo(), and setupBone(). Definition at line 594 of file llvoavatar.h. Referenced by allocateCharacterJoints(), getCharacterJoint(), LLVOAvatar(), and ~LLVOAvatar(). Definition at line 603 of file llvoavatar.h. Referenced by buildCharacter(), computeBodySize(), LLVOAvatar(), LLImagePreviewAvatar::render(), and LLDrawPoolAvatar::renderAvatars(). Definition at line 759 of file llvoavatar.h. Referenced by computeBodySize(), getPelvisToFoot(), updateCharacter(), and updateHeadOffset(). Definition at line 722 of file llvoavatar.h. Referenced by LLVOAvatar(), and processAnimationStateChanges(). Definition at line 899 of file llvoavatar.h. Definition at line 898 of file llvoavatar.h. Definition at line 881 of file llvoavatar.h. Definition at line 803 of file llvoavatar.h. Definition at line 800 of file llvoavatar.h. Referenced by idleUpdate(), and LLDrawPoolAvatar::renderAvatars(). Definition at line 802 of file llvoavatar.h. Definition at line 801 of file llvoavatar.h. Definition at line 771 of file llvoavatar.h. Referenced by buildCharacter(), getJoint(), getOffObject(), getRootJoint(), idleUpdate(), LLVOAvatar(), loadSkeletonNode(), LLPreviewAnimation::render(), LLDrawPoolAvatar::renderAvatars(), sitOnObject(), slamPosition(), LLDebugText::update(), updateCharacter(), updateHeadOffset(), updateJointLODs(), updateVisualParams(), writeCAL3D(), and ~LLVOAvatar(). Definition at line 908 of file llvoavatar.h. Referenced by invalidateComposite(), onCustomizeEnd(), and onCustomizeStart(). Definition at line 625 of file llvoavatar.h. Referenced by buildSkeleton(), getJoint(), LLVOAvatar(), updateCharacter(), and ~LLVOAvatar(). Definition at line 738 of file llvoavatar.h. Definition at line 576 of file llvoavatar.h. Referenced by createDrawable(), LLVOAvatar(), renderFootShadows(), and updateShadowFaces(). Definition at line 577 of file llvoavatar.h. Definition at line 690 of file llvoavatar.h. Referenced by LLVOAvatar(), and updateShadowFaces(). Definition at line 691 of file llvoavatar.h. Referenced by createDrawable(), LLVOAvatar(), renderFootShadows(), updateShadowFaces(), and updateTextures(). Definition at line 721 of file llvoavatar.h. Referenced by LLAgent::clearAFK(), idleUpdate(), isAnyAnimationSignaled(), LLVOAvatar(), process_avatar_animation(), processAnimationStateChanges(), LLGestureManager::stepGesture(), and updateCharacter(). Definition at line 595 of file llvoavatar.h. Referenced by allocateCharacterJoints(), getCharacterJoint(), LLVOAvatar(), loadSkeletonNode(), and ~LLVOAvatar(). Definition at line 919 of file llvoavatar.h. Definition at line 873 of file llvoavatar.h. Referenced by deleteLayerSetCaches(), getBakedTE(), getLayerSet(), hasPendingBakedUploads(), isLocalTextureDataAvailable(), isLocalTextureDataFinal(), loadAvatar(), removeMissingBakedTextures(), requestLayerSetUpdate(), requestLayerSetUploads(), setCachedBakedTexture(), setCompositeUpdatesEnabled(), setupComposites(), updateComposites(), updateMeshTextures(), useBakedTexture(), and ~LLVOAvatar(). Definition at line 672 of file llvoavatar.h. Definition at line 673 of file llvoavatar.h. Definition at line 674 of file llvoavatar.h. Definition at line 675 of file llvoavatar.h. Definition at line 676 of file llvoavatar.h. Definition at line 677 of file llvoavatar.h. Definition at line 608 of file llvoavatar.h. Referenced by buildCharacter(), computeBodySize(), and updateCharacter(). Definition at line 703 of file llvoavatar.h. Referenced by LLMorphView::initialize(), LLDrawPoolAvatar::renderAvatars(), and LLMorphView::shutdown(). Definition at line 733 of file llvoavatar.h. Referenced by LLVOAvatar(), and updateCharacter(). Definition at line 714 of file llvoavatar.h. Definition at line 753 of file llvoavatar.h. Referenced by getStepSound(), LLVOAvatar(), and resolveHeightGlobal(). Definition at line 754 of file llvoavatar.h. Referenced by getCharacterVelocity(), and resolveHeightGlobal(). Definition at line 752 of file llvoavatar.h. Definition at line 935 of file llvoavatar.h. Referenced by getGlobalColor(), loadAvatar(), onGlobalColorChanged(), and ~LLVOAvatar(). Definition at line 934 of file llvoavatar.h. Referenced by getGlobalColor(), loadAvatar(), onGlobalColorChanged(), updateMeshTextures(), writeCAL3D(), and ~LLVOAvatar(). Definition at line 933 of file llvoavatar.h. Definition at line 740 of file llvoavatar.h. Definition at line 709 of file llvoavatar.h. Definition at line 781 of file llvoavatar.h. Referenced by idleUpdate(), and updateCharacter(). Definition at line 885 of file llvoavatar.h. Definition at line 604 of file llvoavatar.h. Definition at line 894 of file llvoavatar.h. Definition at line 893 of file llvoavatar.h. Definition at line 892 of file llvoavatar.h. Definition at line 728 of file llvoavatar.h. Definition at line 785 of file llvoavatar.h. Referenced by idleUpdate(), startTyping(), and stopTyping(). Definition at line 786 of file llvoavatar.h. Referenced by idleUpdate(), and startTyping(). Definition at line 579 of file llvoavatar.h. Definition at line 914 of file llvoavatar.h. Definition at line 870 of file llvoavatar.h. Definition at line 650 of file llvoavatar.h. Definition at line 651 of file llvoavatar.h. Referenced by buildCharacter(), getUpperBodyMesh(), LLVOAvatar(), loadMeshNodes(), loadSkeletonNode(), updateMeshTextures(), useBakedTexture(), and writeCAL3D(). Definition at line 652 of file llvoavatar.h. Definition at line 653 of file llvoavatar.h. Definition at line 654 of file llvoavatar.h. Definition at line 655 of file llvoavatar.h. Definition at line 915 of file llvoavatar.h. Definition at line 923 of file llvoavatar.h. Definition at line 792 of file llvoavatar.h. Definition at line 890 of file llvoavatar.h. Definition at line 971 of file llvoavatar.h. Referenced by idleUpdate(), LLVOAvatar(), and markDead(). Definition at line 745 of file llvoavatar.h. Definition at line 746 of file llvoavatar.h. Definition at line 799 of file llvoavatar.h. Definition at line 798 of file llvoavatar.h. Definition at line 619 of file llvoavatar.h. Referenced by buildCharacter(), LLHUDEffectBeam::setSourceObject(), LLHUDEffectBeam::setupParticle(), and LLViewerPartSourceBeam::update(). Definition at line 620 of file llvoavatar.h. Definition at line 938 of file llvoavatar.h. Referenced by cleanupClass(), initClass(), loadAvatar(), loadMeshNodes(), and loadSkeletonNode(). Definition at line 857 of file llvoavatar.h. Definition at line 864 of file llvoavatar.h. Referenced by forceBakeAllTextures(), onCustomizeEnd(), onCustomizeStart(), LLAgent::processAgentCachedTextureResponse(), processRebakeAvatarTextures(), removeMissingBakedTextures(), LLAgent::sendAgentSetAppearance(), and writeCAL3D(). Definition at line 819 of file llvoavatar.h. Referenced by buildSkeleton(), and setupBone(). Definition at line 820 of file llvoavatar.h. Definition at line 837 of file llvoavatar.h. Referenced by init_debug_avatar_menu(), renderSkinned(), and updateVisibility(). Definition at line 863 of file llvoavatar.h. Referenced by idleUpdate(), and init_debug_avatar_menu(). Definition at line 860 of file llvoavatar.h. Referenced by LLAvatarLODListener::handleEvent(), saved_settings_to_globals(), and updateJointLODs(). Definition at line 826 of file llvoavatar.h. Referenced by cullAvatarsByPixelArea(), dumpBakedStatus(), LLCompositeLimitListener::handleEvent(), and initClass(). Definition at line 818 of file llvoavatar.h. Referenced by saved_settings_to_globals(), and updateAllAvatarVisiblity(). Definition at line 828 of file llvoavatar.h. Referenced by LLViewerObjectList::update(), and updateJointLODs(). Definition at line 841 of file llvoavatar.h. Referenced by send_stats(), update_statistics(), updateAllAvatarVisiblity(), and updateJointLODs(). Definition at line 836 of file llvoavatar.h. Definition at line 835 of file llvoavatar.h. Referenced by display(), and idleUpdate(). Definition at line 834 of file llvoavatar.h. Definition at line 846 of file llvoavatar.h. Referenced by deleteCachedImages(), dumpScratchTextureByteCount(), and getScratchTexName(). Definition at line 845 of file llvoavatar.h. Referenced by bindScratchTexture(), and deleteCachedImages(). Definition at line 844 of file llvoavatar.h. Referenced by deleteCachedImages(), and getScratchTexName(). Definition at line 821 of file llvoavatar.h. Referenced by init_debug_avatar_menu(), and updateCharacter(). Definition at line 838 of file llvoavatar.h. Definition at line 823 of file llvoavatar.h. Referenced by init_debug_avatar_menu(), and LLDrawPoolAvatar::renderAvatars(). Definition at line 822 of file llvoavatar.h. Referenced by init_debug_avatar_menu(), and renderSkinned(). Definition at line 937 of file llvoavatar.h. Referenced by cleanupClass(), initClass(), loadAvatar(), and writeCAL3D(). Definition at line 854 of file llvoavatar.h. Referenced by cleanupClass(), initClass(), and parseSkeletonFile(). Definition at line 832 of file llvoavatar.h. Definition at line 831 of file llvoavatar.h. Definition at line 824 of file llvoavatar.h. Referenced by LLRenderAvatarMouselookListener::handleEvent(), LLAgent::needsRenderAvatar(), saved_settings_to_globals(), updateAttachmentVisibility(), and LLAgent::updateCamera(). Definition at line 852 of file llvoavatar.h. Referenced by cleanupClass(), and initClass().